Access Keyhole’s Market Research archives to learn more about conducting market research at scale across social media and the web. Learn powerful insights. Social media is an enormously powerful tool for managing customer relationships, broadcasting positive brand stories and introducing new products. But while the benefits of this free, fast and intuitive marketing channel are virtually limitless, it also has some potentially serious risks. But there’s good news; with proper planning you can avoid the most common mistakes that lead to a social media crisis. What Causes Social Media Crises? Serious Problems — Employee sabotage and hacking are much more serious offenses. While businesses can, and do, shift responsibility for the malicious post, they’re often criticised for allowing their login credentials to be compromised. Catastrophic Events — Intentionally racist, sexist, or malicious comments made by companies or individuals ignite the worst type of social media crisis. These statements can significantly impact a brand’s revenue and reputation, and recovery could take years. Look no further than Roseanne Barr for a trending example of how powerful one tweet can be. In the days following her comment, Barr’s television contract was canceled, her reputation was heavily damaged, and she lost an estimated $3 million in revenue. So, how can you avoid a social media crisis? Here are 6 steps you can take. The most important steps toward preventing a social media disaster are understanding what crisis management means for your business and creating an action plan to address your risk factors. While you can’t predict every crisis, you can train your social media team to prepare for, and effectively manage, potential problems. Since social media is your front line of communication during a crisis, your plan should include specific guidelines to protect your brand. Most importantly, always have a second set of eyes on every post before it’s published. Companies should also train more individuals in crisis communications and social media management than you think you’ll need. 2. Monitor your Social Media for Trouble! Identifying problems as soon as they arise is critical to crisis prevention. 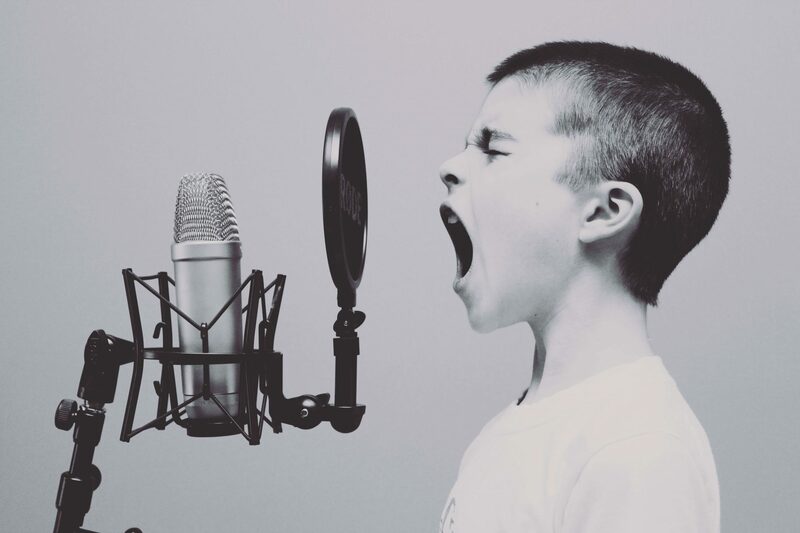 Unfortunately, you may never know about the biggest issues facing your company because 96% of angry customers don’t complain to brands directly. Many of these upset customers prefer posting about their poor experience on their own timeline. These “dark” complaints could go unnoticed, causing negative impact, without proper tools and training. Social listening tools allow you to monitor keywords and indirect brand mentions as well as direct mentions. This gives your company a much more holistic view of what your customers are saying across all social platforms. Keyhole’s Intelligent Notifications feature is an excellent example of how brands can set up alerts to detect direct and indirect (‘dark’) posts with negative sentiment. 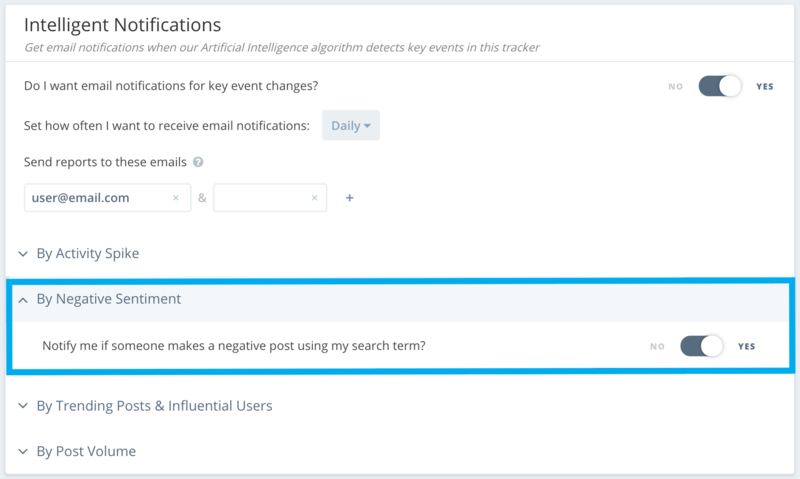 Keyhole AI detects any tracked posts with negative sentiment made about your brand, and you automatically receive an Intelligent notification in your inbox, which allows you to react to the post before the negative sentiment escalates. For instance, United Airlines would have seen this tweet and its volume, the first mention of the United Flight 3411 incident, with Keyhole. This would have given the airline an ample runway to handle the crisis before it escalated. 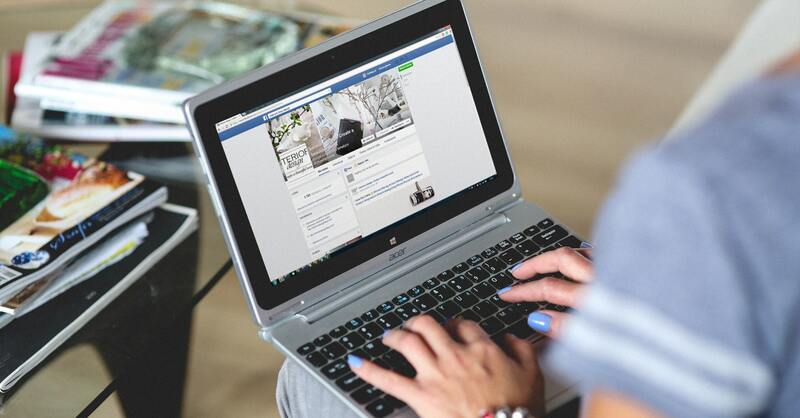 Social profiles are frequently viewed as sales tools instead of powerful customer service platforms for building brand loyalty and customer care. By solely pitching products rather than having meaningful conversations with your followers, you could miss opportunities to address customer experience problems early on. According to Maritz Research, 49% of customers expect companies to respond to Twitter complaints, yet only 29% of those who complained received a reply. Additionally, customers who complain expect a response within 4 hours, while the average brand response time exceeds 10 hours. It’s crucial to respond quickly and professionally when negative comments about your company are discovered. Ignoring criticism, even when it isn’t posted directly to your page, sends a message to your followers that you don’t care enough about them to respond. Knowing how to properly handle criticism in a public forum is essential to protecting your reputation. A single rude response to a genuine complaint will do far more damage to your image than the original comment could. Deleting comments and blocking users may seem like the quickest way to fix a problem, but doing so could cause your customer to become more outspoken. Instead, make an effort to understand what caused the situation and show a willingness to make things right. Consumers typically complain on social media when their problem has not been properly resolved. You may be able to prevent your customers from complaining in public by providing a seamless resolution process on your website or over the phone. Angry customers want to express their frustration quickly, so they usually avoid email. Adding a simple feedback button to your site may prevent them from firing off a raging tweet for all to see. Just make sure it’s easy to find and effortless to use. You could even offer visitors incentives for leaving feedback if it they’ve been poking around your site for a while. Assigning your brand’s social media strategy to an intern or an inexperienced employee may save you money, but it could also be a recipe for disaster. A great social media manager has a level head, is capable of handling a crisis, and is well-organized and detail-oriented. Finding someone with public relations experience adds another layer of insurance against mistakes. Prefer to outsource the work? There are many companies specializing in managing social media accounts for businesses. This option may be the most impactful if you have room in your budget. Most people might think their private social profiles are safe for ranting about work stress, but negative posts can have serious consequences if customers or coworkers see them. Distribute guidelines about how to reference your brand online, but don’t scare your team away from posting. Happy employees are some of the best recruiting tools you can ask for! The benefits of using social media intelligently will always outweigh the risks. Remember to monitor for problems, listen to your followers, react quickly and compassionately, and plan ahead, that way you’ll be able to maximize the benefits of this channel while avoiding potential crises. Website getting traffic but still not getting conversions? If you think your content’s fine, then perhaps you need to take a look at your keyword strategy? Yes, you sometimes need to go all the way back to make sure you’re drawing in quality leads from the right channels. It doesn’t matter if you’ve got the most brilliant and engaging pieces of content in the world. If you targeted the wrong keywords, none of your PPC, SEO, or content marketing strategies will consistently produce profitable results. The good news is, keyword research doesn’t necessarily have to be extremely difficult. With the right tools and tactics, you can definitely discover lucrative keyword opportunities without breaking a sweat. In this post, we’ll show you the best ways to do keyword research so you can bag winning keyword suggestions every single time. Regardless of niche, keyword research always starts with a seed keyword that’s too broad and competitive to be feasible. That’s why you need tools like Ubersuggest to expand your seed keyword into hundreds of long-tail keyword ideas. These are keywords that are at least 3 terms long and target a narrower audience. To use Ubersuggest, simply enter your seed keyword and click “Look Up.” Don’t forget to adjust the localization of your keyword to generate suggestions that are relevant to your place of business. Within seconds, Ubersuggest will generate hundreds of long-tail keywords as well as present the metrics that can determine their profitability. The first metric measures the average monthly searches. This can be directly used to gauge a keyword’s popularity and demand. Short for cost per click, the CPC metric denotes the average amount that advertisers are willing to pay for PPC advertisement actions. A high CPC often signals that a particular keyword can be monetized and converts well. Lastly, Ubersuggest measures the competitiveness level of keywords on a scale of 0.0 to 1.0. 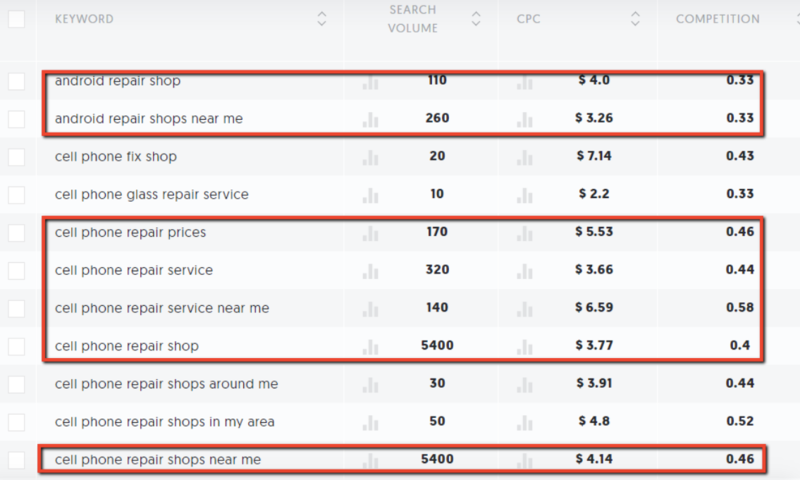 For faster results, it’s recommended that you target keywords with a competitiveness score of around 0.4 or less. At this point, you should be able to come up with a fresh lineup of long-tail keywords (whether for PPC or SEO) based on the initial results. But don’t get overexcited — there’s still much work to be done to make sure your keywords lead to conversions. A rule of thumb when doing keyword research is to find the balance between search volume and competitiveness. Of course, you don’t want to target keywords with barely any demand at all. You shouldn’t go with the flow and pick up a keyword that everyone else uses, either. What you want are long-tail keywords that pertain to a user’s desire to take action. You can do this by injecting commercial or transactional terms into your Ubersuggest keyword suggestions. 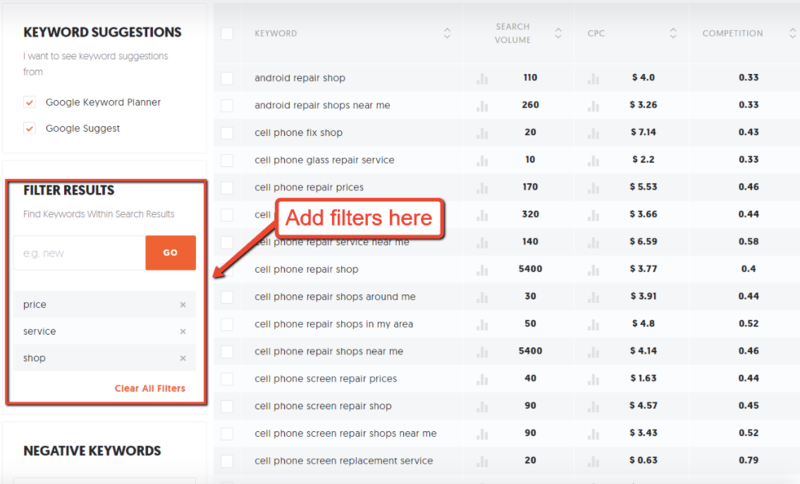 Just enter terms like “buy,” “price,” “service,” “shop,” or whatever term makes sense for your seed keyword in the “Filter Results” field. If you’re trying to build traffic through social media, then you’ll need a slightly different approach when doing keyword research. The main issue is that social media networks use internal search engines that don’t use the same keywords as web platforms like Google. As such, you need to use a keyword tracking tool that’s specifically tailored to social media networks. Just like Ubersuggest, you can start using Keyhole by entering a seed keyword. This time, however, you need to specify if you want to track a hashtag, keyword, URL, social media account, or brand mention. To fine-tune your keyword tracker, click “Advanced” to reveal the filters you can use to refine results. For example, if you want to ignore posts from a direct competitor, click on “Ignore posts” and fill in the rest of the details. After the initial data is produced, you should be able to see pertinent information, such as the number of posts with your keywords, their collective reach, and even the overall sentiment of users. Before you save your tracker, don’t forget to specify how you want to receive alerts. This will enable you to be always in tune with social media users when it comes to your target keywords. Remember that tracking keywords on social media can improve conversions in two ways. Apart from letting you gauge the demand for a keyword, it will also give you opportunities to initiate and close conversions yourself whenever your brand or product gets mentioned. For this, simply, track your brand name or social media handles via Keyhole. 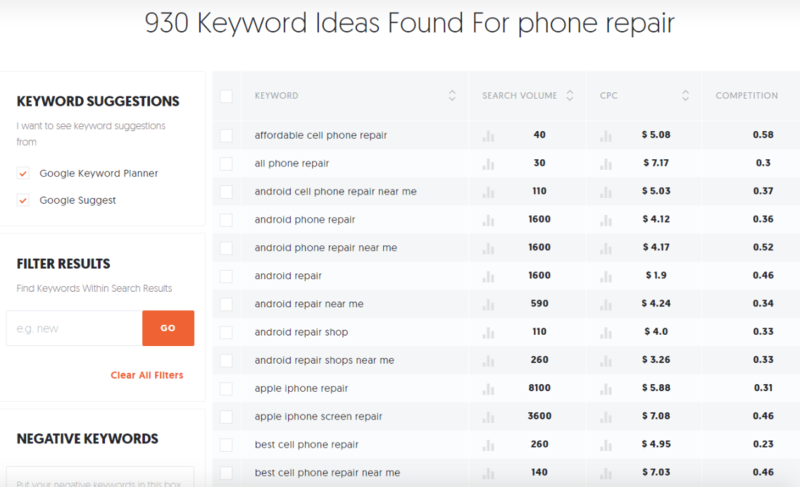 Once your Keyhole tracker is up and running, it’s time to snag yourself some keyword ideas. From the main dashboard, navigate to “My Trackers” and select the tracker you want to work with. This will pull up real-time data based on the tracking options you’ve set earlier. How can social media keywords boost your conversions? Remember that most if not all online users only transact with brands they trust. By participating in conversations and offering your expertise to social media users, you slowly build your brand’s authority in your niche. Of course, researching hashtags will also allow you to extend the social reach of your content whenever you share something. To learn more how to leverage social media networks to win your audience’s trust, you can refer to more guides here. Keyword research is a fundamental piece of online marketing that marketers love to overlook. Hopefully, the guide above put keyword research in a new light. It’s not necessarily the most difficult aspect of online marketing, but it can have the biggest impact when it comes to the visibility of overall profitability of your website. Do you have other suggestions on how marketers should perform keyword research? Feel free to share your thoughts in the comments below! Do you use hashtags — catchy, attention-grabbing conversation anchors that people want to be associated with? If not, you can learn how here. Hashtag 101– If you already know what hashtags are, skip this part and proceed to advanced hashtag uses below. How hashtags work: When you use a #hashtag, you are adding your post to a list of all other posts that use this tag on that social platform. 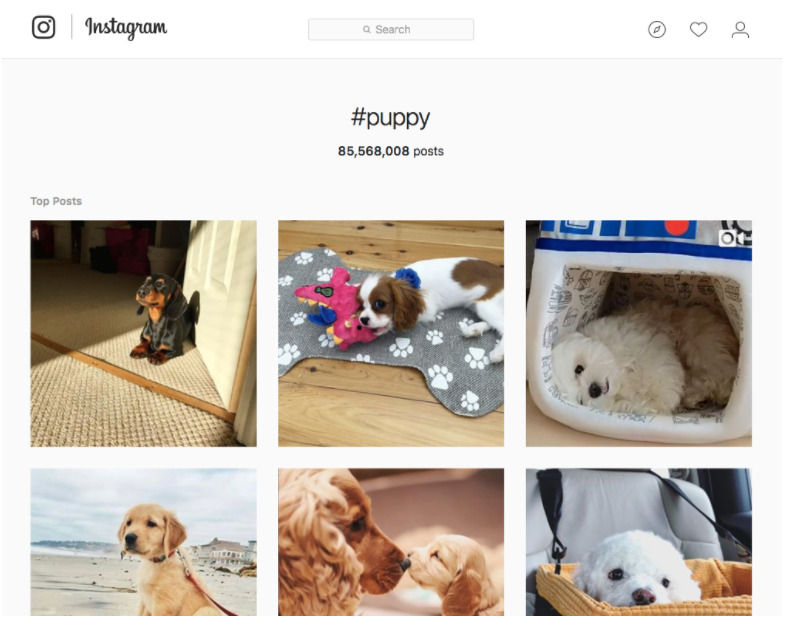 For example, if you post a picture of your dog with #puppy in the caption or description, your post is now grouped with all other #puppy posts. Whenever someone searches #puppy on instagram for example, they will see all #puppy posts. Popular hashtags are a major deal. 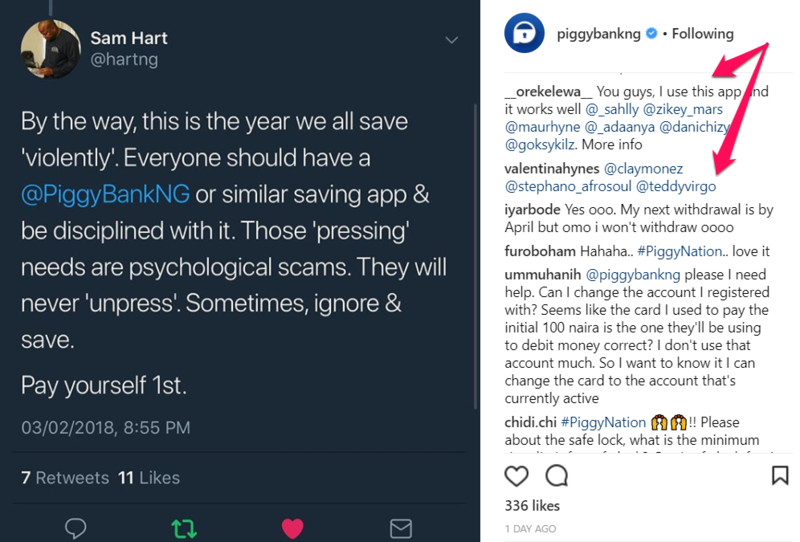 They engage social media users on a higher level. No wonder Instagram images or videos with at least one hashtag generate 12.6% more engagement than posts without hashtags, and tweets with hashtags receive 2x more engagement than tweets without them. This doesn’t mean hashtags are an automatic ticket to social media success, but they can and do engage people by allowing them to become part of something larger than themselves. Hashtags impart a sense of belonging — and encapsulate people’s beliefs, cultures, and professional brands. In an article on Salesforce, expert digital marketer Ann Smarty listed three hashtags that people follow for news on social: #twitternews, #socialmedianews and #socialmedia. When people use or follow hashtags like these on social, they get to feel they’re a part of some huge; that’s the power of hashtags. Latch onto already popular unbranded hashtags and exploit them to grow your business. The three hashtags I mentioned from Ann Smarty are good examples of unbranded hashtags. I’ll be sharing how to use these two different hashtag types to grow your business in this post. Let’s begin with unbranded hashtags. These are usually popular hashtags that weren’t necessarily started by your brand. They’re often industry hashtags like #marketing, event hashtags like #SXSW or day-related hashtags like #MusicMonday or #TuesdayInspiration. These are the basics. Tagging your posts with relevant industry, event and day-related hashtags will help you be a part of key conversations for your brand. Just as its name implies, CTA hashtags encourage people to take an action. Example: #BeYourOwnBoss or #StartABusiness. These hashtags tend to work well because they encourage people to participate in something fun or rewarding — and everyone likes fun and rewards. More importantly, they persuade people to take an action on your tweets or posts. You want to look for popular CTA hashtags that are related to your brand or product and engage prospects with them. These hashtags are especially rampant on Instagram and Twitter. The CTA hashtag #tagafriend, however, encouraged people to take an action — tag their friends. 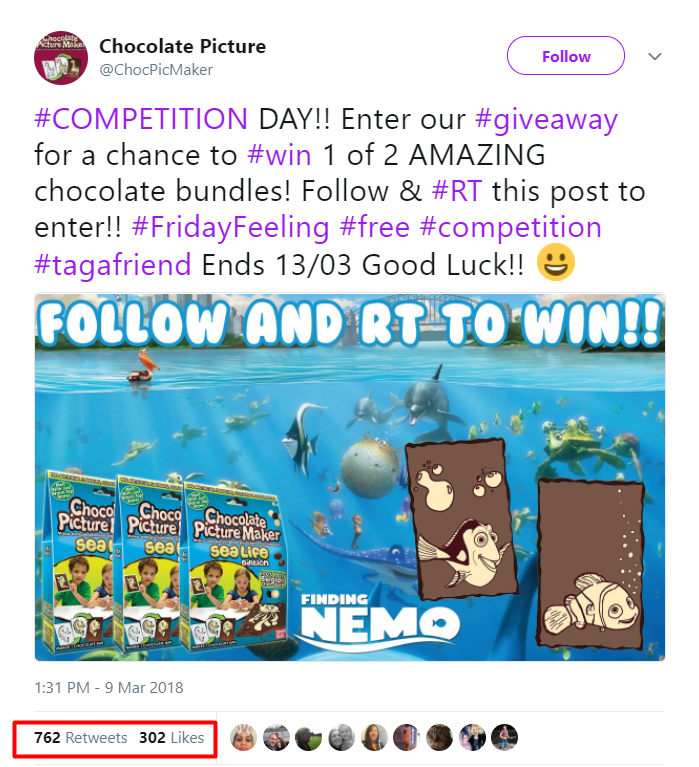 Plus, the CTA hashtag exposed the tweet to an audience that follows the #tagafriend hashtag and who may not have heard about Chocolate Picture before. Twitter gets over 300 million users per month, and the platform has a section called Trending. On a smartphone, Twitter Trending can be found once you click the search tab in your Twitter app. And it’s either on the left or right side of your desktop screen. 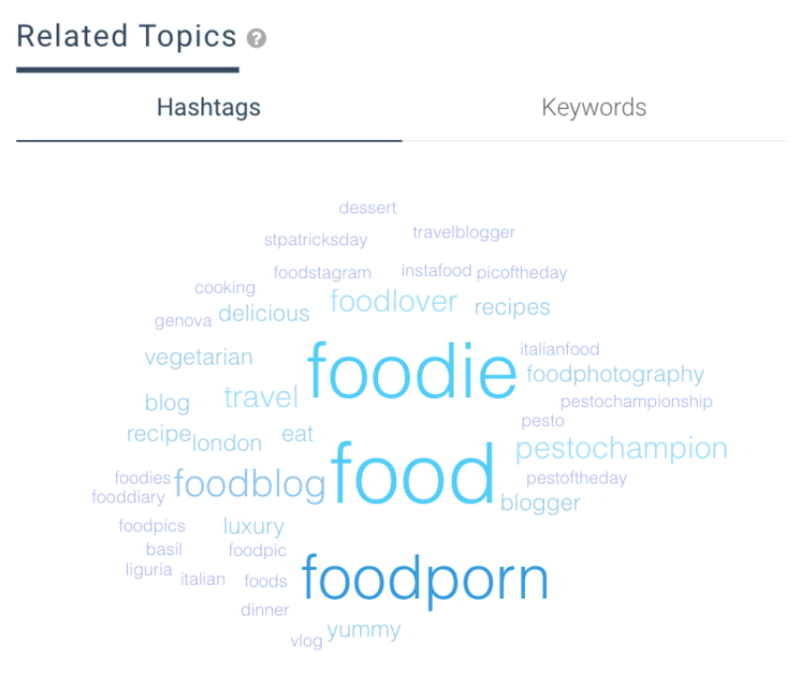 These keywords and hashtags represent what people are talking about at any given time on the platform. You can see how this easily creates an opportunity for you to chip in your tweets on the matter discussed, and expose your brand to a new audience. How you chime into these trending conversations, however, can make or break engagement for your tweet. Your tweet needs to be timely and relevant to the topic being discussed. Any irrelevant or untimely tweets will be ignored by tweeters and get buried under other tweets. This doesn’t mean you can’t participate in conversations outside your industry; you can, but you need to ensure it’s relevant to the topic being discussed. 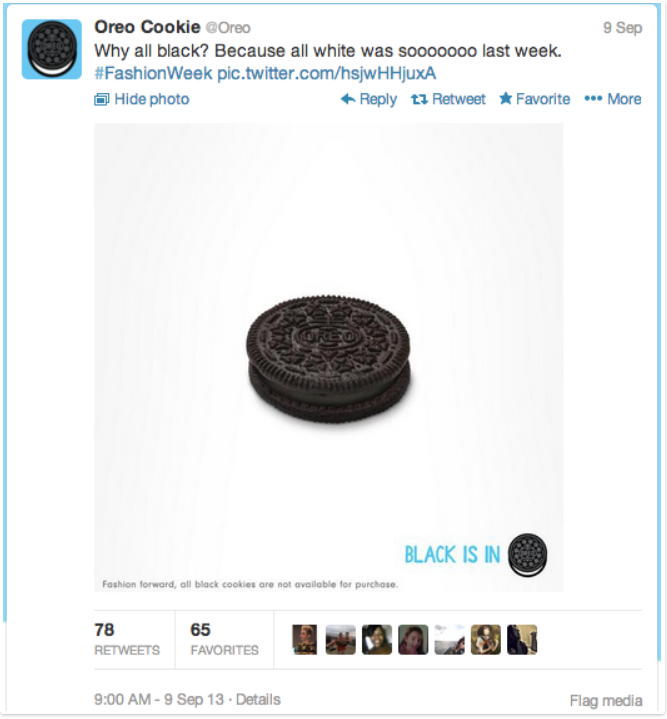 Oreo has nothing to do with fashion or Fashion Week; they’re clearly not a clothing brand, but they promoted their brand using the hashtag while making sure it’s related to the topic being discussed. Pretty clever. Remember, Twitter trending tweets can stop trending at any time — they might be popular anywhere between minutes to a few days. You want your entry into trending conversations to be relevant and timely. 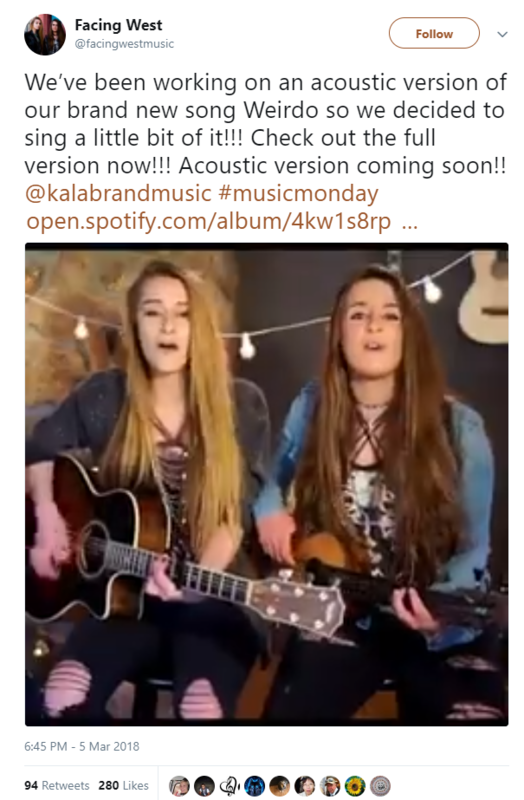 This exposed their brand and music to a new audience and enthusiasts who follow the hashtag. Twitter users use the Twitter Trending to stay abreast of what’s hot right now. They want to be in the know and not the last person to hear about some hot news. Do your brand a huge favor by chiming in on trending conversations and taking advantage of the lively engagement there. Hashtags are crazier on Instagram than they are on Twitter, or any other social platform for that matter. 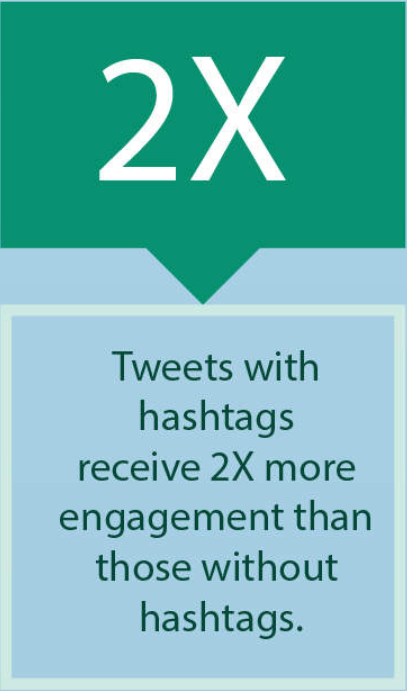 Using more than two hashtags on Twitter can make your engagement rate plummet. But on Instagram, the more hashtags, the merrier your engagement. You can use up to thirty hashtags on each post. I’d recommend sticking to three or four in the comments and then adding more into a comment below. It seems strange, but this is acceptable on Instagram. If you want to use eleven hashtags in total per post, that works best on Instagram. Enter niche hashtags. These hashtags are often used by people who are not just in your industry, but are in the same niche with you. 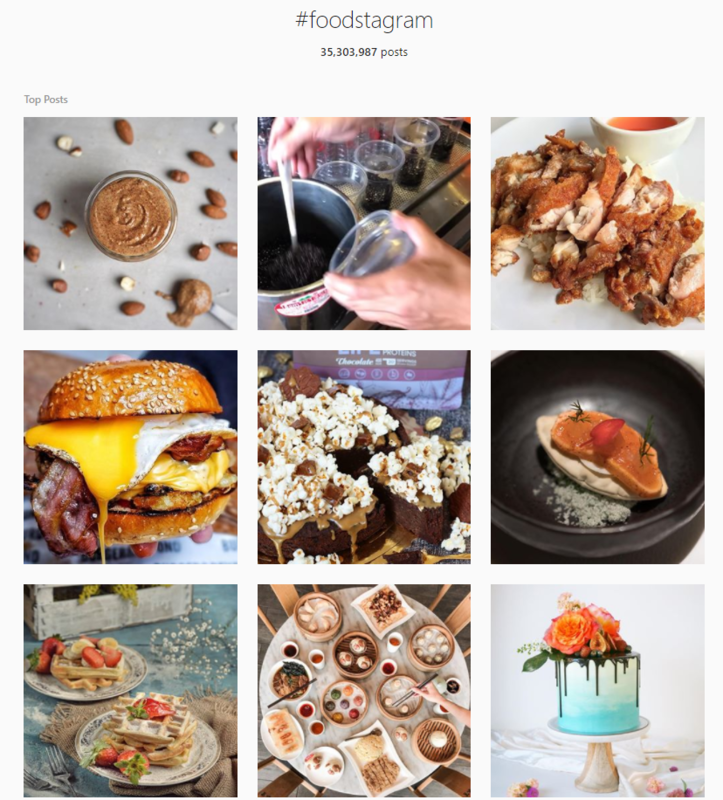 Instagrammers who are interested in seeing pictures from food bloggers — but not restaurants or random food lovers — they’ll use the #Foodblogger hashtag to narrow down their search that finds just the food bloggers they’re looking for. Your industry hashtags are often used by everyone in the industry, so they naturally get more impressions than niche hashtags. 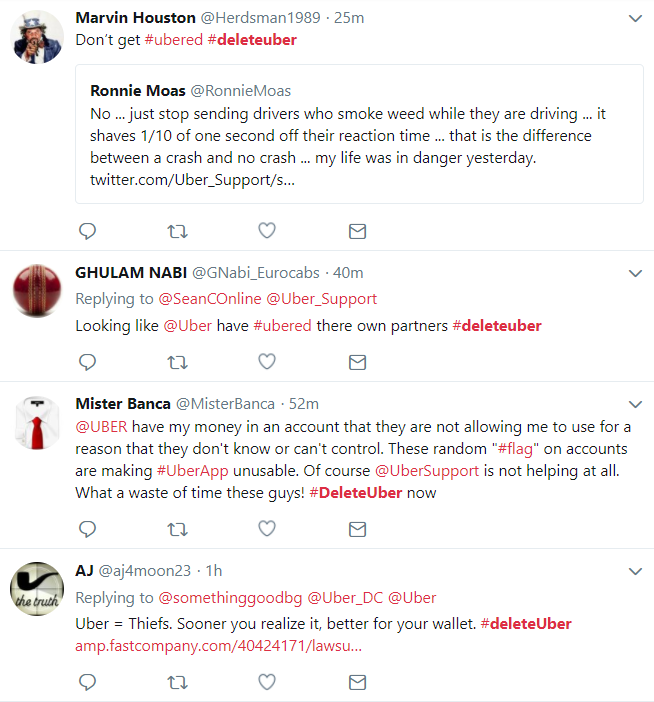 But you want to use niche hashtags to engage with your own target customers. To see what hashtags are relevant to your specific industry of brand, tools like Keyhole can be very helpful. You can insert a trending #hashtag or keyword into our tracker, and the Word Cloud feature within the main dashboard will show you what other hashtags or Keywords people are using along with it. These are hashtags started by your company. You know, the one you can lay a 100% claim to and enjoy all the benefits. Branded hashtags don’t have to have your brand name in them, even though they sound like they should. But they should be related to your product or campaign name — so customers can link the hashtag to your business ultimately. And if done right, they can become very popular hashtags that will take your brand to a higher level. Here are three strategies for growing a business with branded hashtags. This is one of the most common hashtag marketing strategies out there. You start a contest and require target customers to use your hashtags in their posts to qualify for the contest. It’s like you’re starting a party and you’re asking everyone to come and eat. Everyone loves free food and drinks, right? That’s the idea. Where it gets a little difficult is coming up with the perfect hashtag that people can relate to your business. One of the most successful branded hashtag so far is #ShareACoke — though, it wasn’t exactly a contest as we’re discussing here. The hashtag is simple, which makes it memorable. It clearly flaunts the brand’s name. It’s a call-to-action (CTA) hashtag — as it encourages people to take an “fun” action, share a coke. You can learn from this and make an effective and memorable hashtag for your business. Make it reflect your brand name clearly, make it simple and make it a CTA — you know, like #DoSomethingFun. To get even more juice from this, you can ask contest participants to tag your business handle in their entries. This may reduce the amount of people participating in your contest since you’ll be stressing them more by asking them to do more tasks. But you’ll be getting more bang from your investment — 54% of users surveyed by Twitter reported that they had taken action after seeing a brand mentioned in Tweets (including visiting their website, searching for the brand, or retweeting content). In plain English, you get more ROI when users tag your brand in their entries for your contest or promos. This means that you must have planned this hashtag ahead of time — it should have been ready long before the event day. In fact, planning it out long before the D-day gives it greater chance for good publicity. Before the popular Social Media Week starts in every country, the #SMMW18 hashtag always has enough time to get in the hands and consciousness of people. Perhaps that’s because the hashtag has been planned and publicized months or weeks before the event starts. And it’s one of the main reasons why virtually all marketers in many countries don’t miss out when the event date finally hits. The beauty of this is that once multiple people start tweeting with your hashtag during an event, Twitter notices the spike for that hashtag and adds it to their Trending list — which exposes your hashtag to Twitter users who like hot news. This means more people will be seeing your hashtagged posts. It can lead to a massive explosion and brand awareness for you. And you may also attract people who haven’t heard about you or your hashtag before. They can become curious as to who you are why you’re trending on their Twitter. Social networks want to feed their users with the best content their platforms offer. And it’s the same for your business. You want your best content consistently visible for optimal customer engagement. Google, Youtube, and most other platforms also operate in this way. They all have top posts in a category on their platforms so more users can find them. When your tweets or Instagram posts get significant engagement, they are ranked in the top sections of the platforms they’re on for the hashtag(s) they contain. 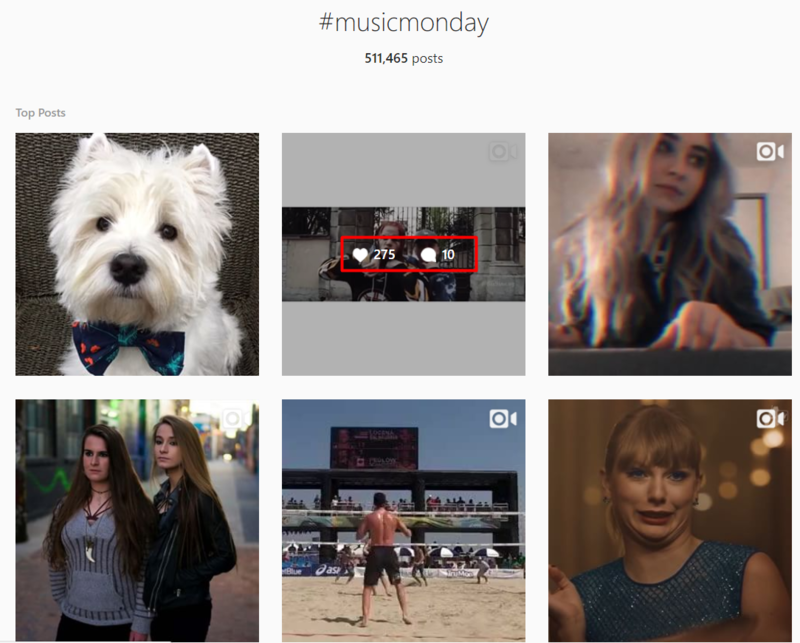 For example, if your your post on Instagram with #musicmonday gets healthy engagement, say 200 likes and 20 comments, it can get ranked on the top posts section of Instagram. If you’re already a popular brand, your hashtagged posts will naturally get hundreds and thousands of Likes or Favs, retweets, and replies in no time. And this will move your posts to the top sections of social networks. And, to amplify your reach, you may use influencers. But if your brand is not so popular yet, you need to go to a little more work. You especially need influencers who will spread the word about your brand and hashtag. Ask your network — existing followers, customers and friends — to Like your posts so they reach more people. Popular hashtags are a big deal. They raise an entire village of brand advocates, like what’s happening with Coca-Cola’s #shareacoke today. 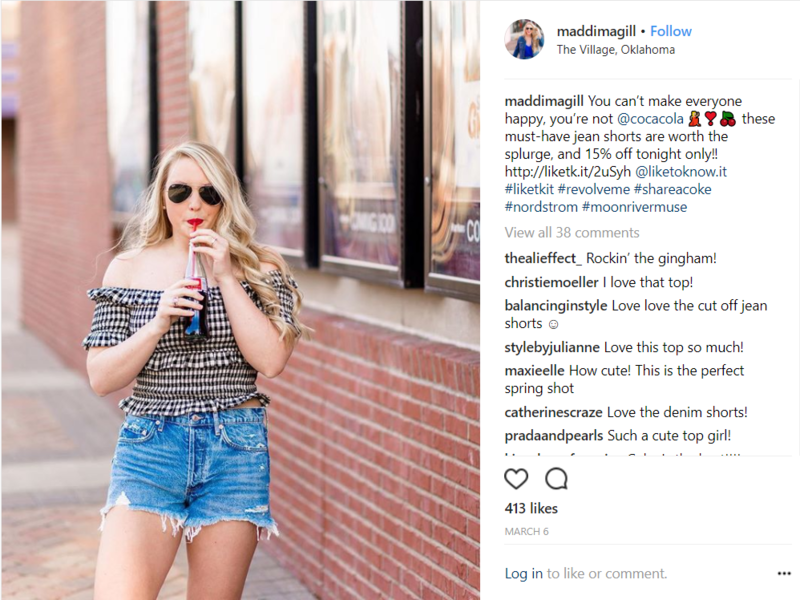 The drink company is still enjoying all the brand awareness and sales that come from the hashtag, as many of their customers are eager to take fancy pictures with a bottle of coke and share it on social using the hashtag. It’s the same for every other brand that has worked to create popular hashtags. Businesses that latch on to unbranded hashtags they didn’t create themselves also enjoy some level of success as seen with the Oreo example above. 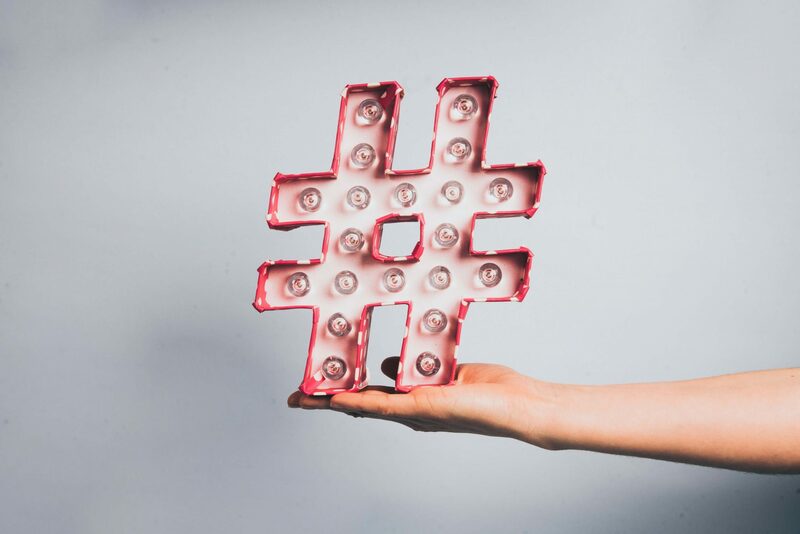 In the end, whether you create your brand hashtag or latch on to unbranded hashtags you didn’t create, your business is bound to see an uptake in engagement and sales if you hit the right combination. Take a chance and experiment with hashtags. Learn to capitalize on what’s trending and help your business by becoming part of the hashtag trend. Of the 7.5 billion people in the world, 3.03 billion of them are active social media users. Your customers are, obviously, among these users and they have conversations on social platforms every day. This creates an opportunity for you to listen to what they are saying and learn more about them. And that’s basically what social listening is — monitoring what customers are saying on social. But it wouldn’t make sense to just listen to what people are saying about you or your industry. If you’re a good listener, you are learning, and if you’re a good student, you apply what you know. Koka Sexton of Slack once shared his journey with social media, where he explained how he sees social media as not just a platform to interact with people, but to build a pipeline of relevant customers to grow businesses. I came across this idea of social networks. (…) At that point, the idea of leveraging social networks as a sales person was basically unheard of. My focus was optimizing that behavior. (…) I had the goal of building my pipeline and not building a brand or building a fan base. It’s not enough to listen or even watch your fan base grow, you need to use what you’re listening to to grow your business. What you need is a toolbox of the social listening strategies that can help you benefit from monitoring social interactions. How do you make the most of the conversations that happen about your brand and industry on social media? Here are five social listening strategies to grow your business faster in 2018. Like top-of-the-funnel buyers, bottom-of-the-funnel consumers are also always lurking around conversations about your industry, brand, or specific product. These people have heard about your brand before. And they’re ready to buy. They just need a few questions answered. So they ask questions like “Is there a version that will include xyz feature coming soon?” OR “Can your product do this specific thing?” If you’re keeping tabs on conversations in your industry, you’ll be able to pull these prospects into the fold. In 2017, top car brand Audi had a tweet where a prospective Audi buyer (Godwin) asked if they had any new upgrades on a couple of their cars. Audi responded saying the feature is coming in 2018, and sent the buyer a link where he could sign up with them to get updated once it’s out. Once the buyer clicks the link, Audi sends him to a well-designed landing page where he’s being welcomed as a lead. The car brand gets his info and gets the chance to alert him once his desired feature is out in the market. This is one of the best social listening strategies I’ve seen anywhere. And there’s one beautiful but quite hidden advantage here: 67% of Americans say they get at least some of their news on social media. This means while Audi is responding to Godwin with a signup form to fill, there are probably other potential buyers around who have the same question Godwin asked and would sign up to get updates from Audi as well — via the same page Audi sent to Godwin. This way, Audi is using social listening as a tactic to generate more leads for their new car upgrade coming in 2018. 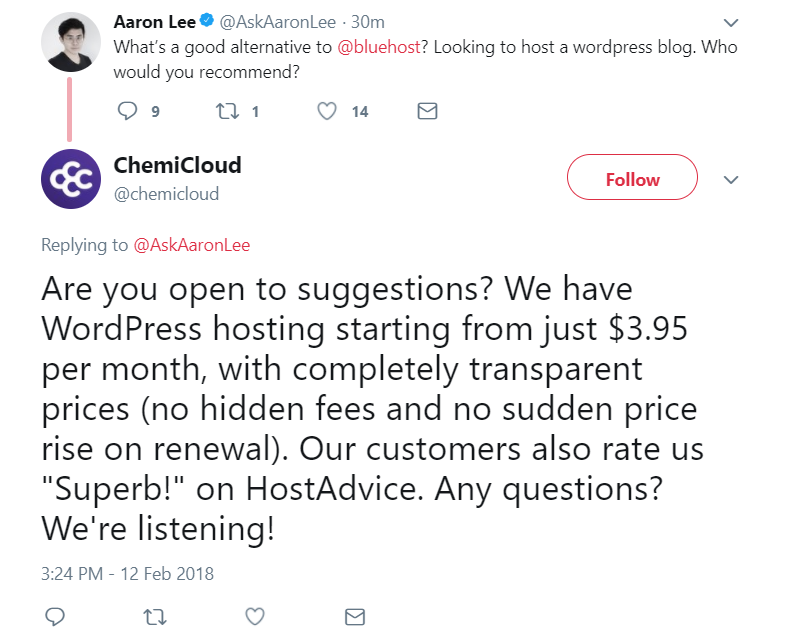 Another example: Aaron Lee, Regional Manager at Agorapulse, recently tweeted that he was looking for a good web host for a new site. New web host provider, ChemiCloud, took the stage and introduced Aaron to their new hosting platform. 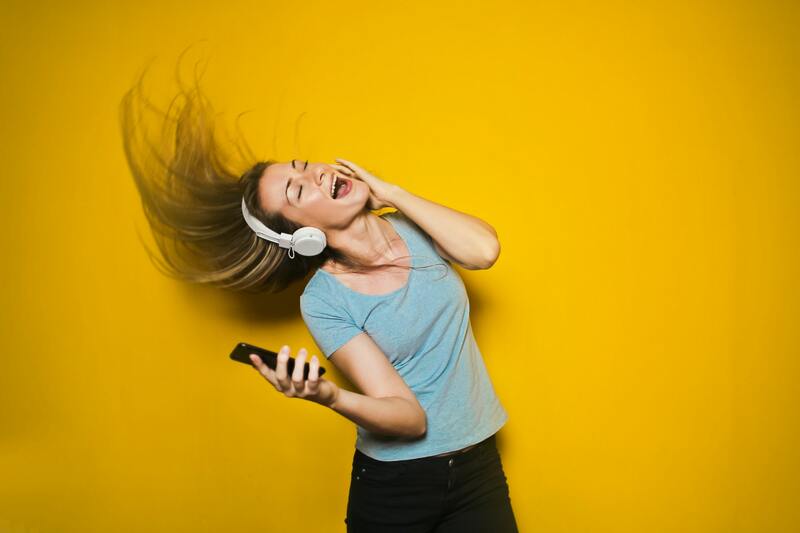 It’s a powerful social listening strategy to monitor these industry interactions and earn the opportunity to convert bottom-of-the-funnel prospects into actual paying buyers. And if, like Audi, you don’t already have the feature or exact product a potential buyer is asking for, have a well-designed page ready to convert the person into a lead — so you have the opportunity to draw them back to your business when it’s time. In social conversations in your industry, top-of-the-funnel (TOFU) customers are also always lurking around. There’s always someone hearing about your brand or product for the first time or just seeing conversations about your brand or industry. Unlike the customers represented in my #1 strategy above, these people aren’t ready to buy anything; they only want to learn more about the matter being discussed — your product, brand or industry. You can refer these customers to a piece of content, a handy tool, or any value that answers their questions and get them ready to buy. Should you gate content (or any value at all) for TOFU customers? 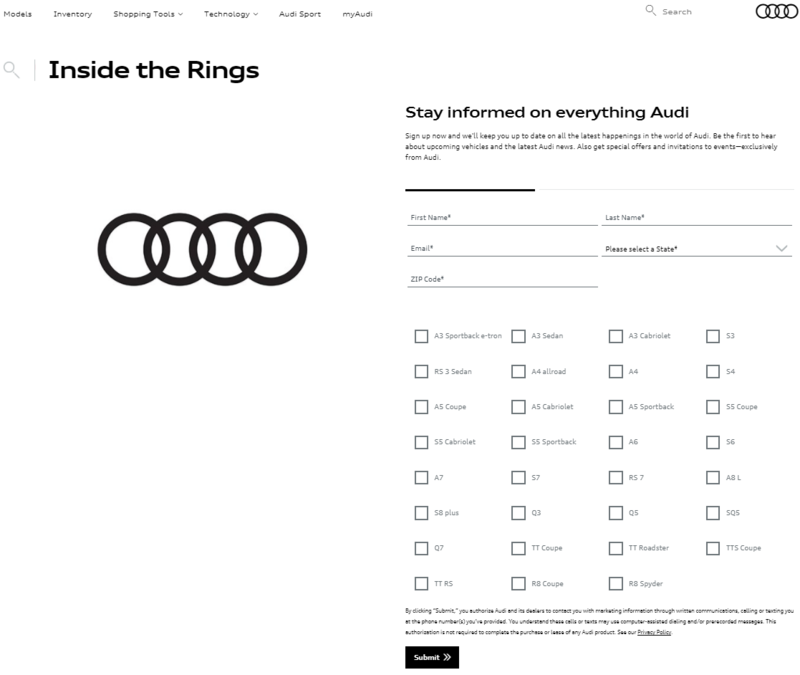 Audi, in the example above, sent ready-to-buy prospects right from social interactions to a gated page; should you do the same for top-of-the-funnel customers? Not quite. Would you click or not? You probably would. After all, you’re the one looking for answers. But on getting to the page, you find a form asking for your personal information. Would you give your information just to learn more about a product? You probably won’t. Especially when you’re just trying to see how to get started with a product. If you were ready to get started, that’s a different case, you’d sign up. But gating a page that’ll teach you how to get started? Not ideal. So it’s best to make your tool, content or any other value ungated for TOFU people who just want to “learn more”. You’ll also notice in the example above that Audi included a link in their tweet for top-of-the-funnel buyers to get more information about their available product (car). The link takes TOFU prospects to a page that provides them with useful and intriguing information about the car. They learn about the different features of the car, like its new automated driving feature and interaction intelligence. Remember, these are top-of-the-funnel customers from Audi’s social listening efforts. The car brand could have just tweeted and let it end there. But no, they squeezed more juice from their social listening and moved interested buyers further in their purchase journeys. Here comes the horrible bit of social listening. If you weren’t paying attention to what’s being said about your brand on social media, you’d be safe — like a turtle with its head in the sand. But if you’re listening, you would have to come across people who are not so pleased with your brand or product — AKA unhappy customers. 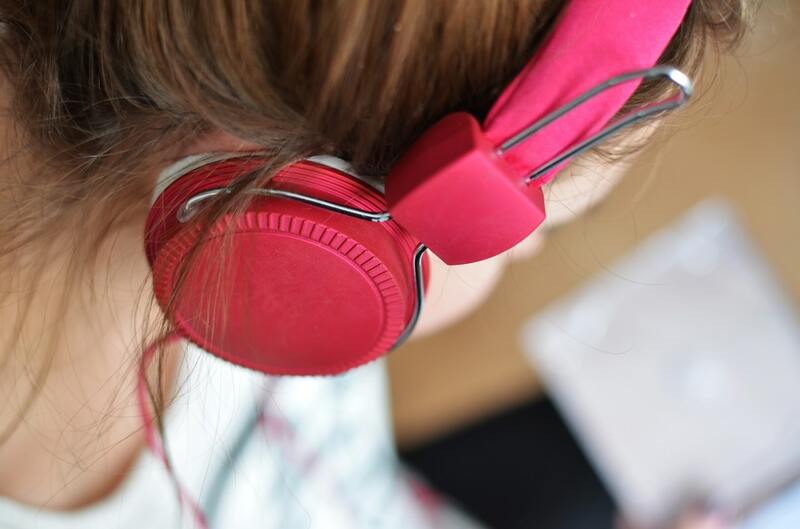 Want to listen to your brand social interactions this way? Try Keyhole. But what you do after getting bad reviews is what matters the most. While you don’t have direct control over the reviews people leave, there are two ways you can indirectly improve them:(1) Listen to negative feedback and use it to improve your business, and (2) Encourage satisfied customers or clients to leave reviews. This will dilute the impact of any negative reviews you receive. Much of the damage from negative feedbacks is salvageable. And, working with complaints can be an opportunity to prove you really care about customers. Since these conversations happen on social media, everyone gets to see how you handle critics — especially when you handle them timely. For social customer experience, it’s important to speak to users where they are and when they need you. It’s not just about Facebook and Twitter complaints. It’s about complaints that arise anywhere, including your own website. However, it can be overwhelming to take note of every single piece of negative feedback, but the trick is to find the public embarrassments your company can do something about and handle the situation with finesse and style that impresses onlookers. 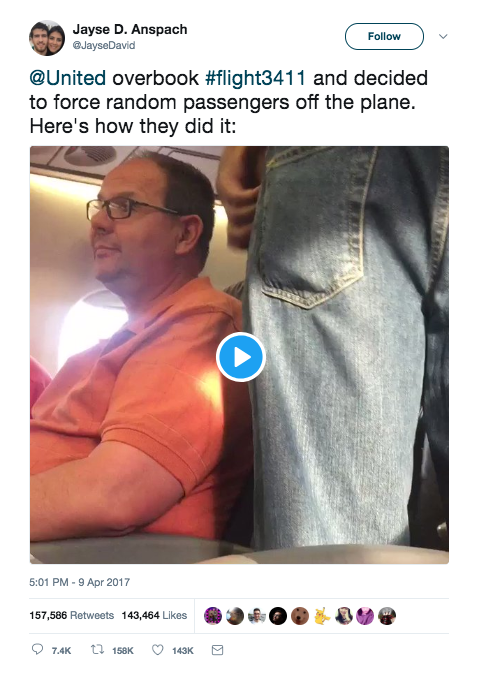 For example, JetBlue got a tweet from a customer who was complaining about being on a flight that had a bad headphone jack and a malfunctioning TV. JetBlue responded with what clearly looks like more than just an apology; they offered to compensate the customer with a $15 credit for the inconvenience (once she can confirm she’s the actual customer who had the experience). Enough said about negative feedback. What do you do with the positive news? When monitoring your social analytics, you’ll come across encouraging and energizing feedback about your brand or product. What do you do with that kind of tangible evidence? Just be glad you got a good note? No, repost them (or retweet if it’s Twitter). That’s one of the most effective social listening strategies you can utilize. Retweeting or reposting your customers’ positive feedback is a great strategy because it reminds your followers of the awesomeness of what you’re selling, and it will likely interest new leads who happen to hear others raving about you. And customer content, like reviews and positive feedback, yields as much as a 133% higher conversion rate. 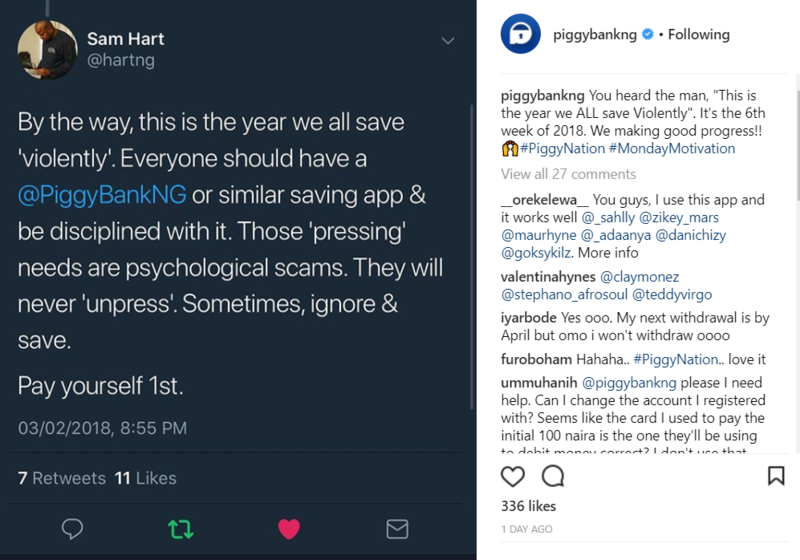 Money saving app Piggybank does a great job at this. They repost the positive reviews they get from Twitter right on their Instagram page. That said, you can’t possibly repost every single positive feedback — especially if you’re a huge business where your comments pile up in the hundreds and thousands. But use the great ones. Using this as one of your core social listening strategies can put you on the good side of your customers and lead new folks into your funnel. After all’s said and done, one thing that can make or break your social listening strategy is your social listening or monitoring tool. It’s the single tool that your entire social listening strategy will be built on. Heck, there’s hardly any campaign you’ll run today successful without using some marketing technology. Analyze the most engaging posts about your brand so you can leverage them. Alert you when an influencer talks about you so you can leverage that too. Tell you once a keyword or topic you’re tracking is being talked about on social. Will have all these functionalities in one platform. There are several tools out there. We recommend Keyhole. Are we biased because that’s our tool? Well, don’t take our word for it. Conversations will always go on in your industry, and when they do, you want to join in and take advantage of the chatter. Whether people are holding conversations directly about your brand, your industry, or your competitors, information is passing between people at high speed. You simply have to keep listening and monitoring. The social listening strategies above reap your company lots and lots of benefits. Be proactive and take advantage of the tools out there to be a good listener. Take notice and look lively. Your business will be one of the best because you did. Brand mentions on social media can drive significant results for your business. 58% of consumers follow brands through social media. Imagine your brand getting mentioned by tens, hundreds, or even thousands of people. Or getting lots of replies from potential buyers to your social media posts. It’s possible. People go to social media to talk about things that they find exciting, sad, or useful. You can have them talk about your brand if you know how to make that happen. Industry events are already popular, drawing large, attentive audiences. You can do something remarkable in the context of an event to expose your brand to a lot of relevant prospects. Think of the industry event like a cube of sugar thrown onto the ground. Within minutes, the cube is covered with ants. It’s the same with industry events. Although the exposure you get from them is short lived, you’re bound to have an impact on a few key players when you create a scene during the course of the event. For example, Social Media Week is one powerful event in the digital marketing space, especially in the social media niche. 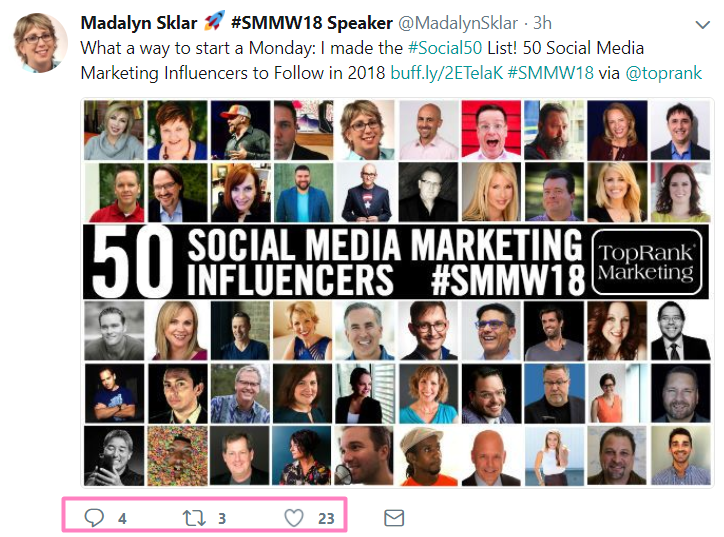 TopRank created a list of 50 social media marketing influencers and featured Twitter Marketing Pro Madalyn Sklar in it — alongside 49 other influencers. Her tweets would normally get one or two likes, retweets, or replies in 24 hours. But this one was quite different. Sklar got 23 likes, 3 tweets and 4 replies (or brand mentions) in three hours. These aren’t very big numbers, but it’s a significant increase in relative average engagement. 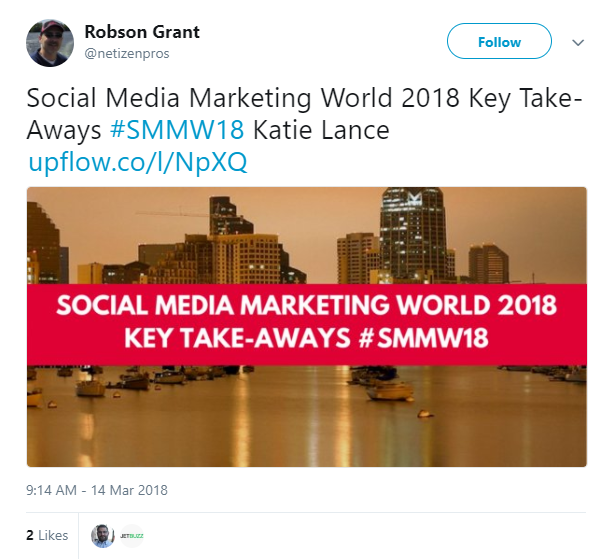 TopRank had other featured influencers share the post on social media using #SMMW18. Social media guru and founder of Up My Influence Josh Elledge didn’t just tweet the post with the #SMMW18 hashtag, he pinned the tweet so it gets more exposure. Imagine the buzz created when 50 industry influencers are tweeting about them using the hashtag while Social Media Week is going on. It’s a good example of creating something remarkable around popular industry events. A list of 50 social media influencers publishing while Social Media Week is going on is a powerful strategy to build brand mentions for TopRank. However, before capitalizing on any event hashtag, you want to be sure the event is big enough and its hashtag is popular enough to drive your much needed social media brand mentions. This is where social monitoring tools come in. For example, using the Keyhole (disclosure: I’m working with this brand) social monitoring tool, you can see key data about Social Media Week’s hashtag and then judge whether the event hashtag is worth creating something big about, or not. Want to see the popularity of an industry event’s hahstag? Try Keyhole. From this tracker, you’ll find that between February 23 and February 26, posts about #SMMW18 have reached over 6 million people on Twitter and Instagram. Once you’ve seen the quality of the engagement an industry event has and it meets your needs for exposure, you can go ahead and create something exceptional using the event’s hashtag. It’s a powerful way to drive brand mentions. Another strategy to drive social media mentions using influencers. It’s a strategy most brands are using these days, but how do you ensure you’re doing it the right way? The key is to avoid using all types of influencers. For every $1 spent on influencer marketing, you get a $6.5 return. That’s quite a huge profit. But, you don’t need all the possible influencers out there. While this may sound counter-intuitive, it can help increase your ROI and cut unnecessary costs. Maybe you’ve seen stories and case studies of how influencers have helped your competitors (or any brand at all) grow, and then you feel you should get your hands on all the influencers you can think of. 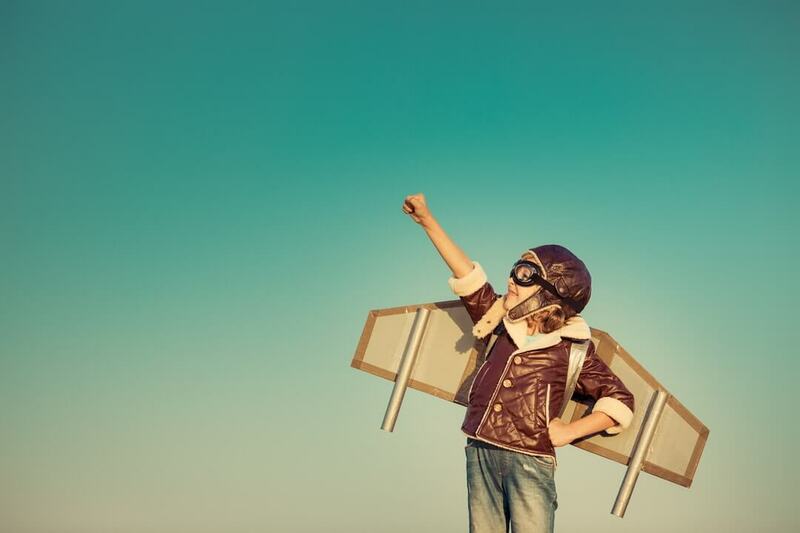 The more the influencers, the more your reach, right? To begin, use listening tools and do keyword searches to learn who in your industry is talking about topics or products relevant to your business. In a bid to use all the influencers you can get your hands on, you may end up using some who don’t have your target audience as followers. Instead of spreading yourself thin in that way, cut back and work with just the influencers who can expose your brand to an audience hungry for your content or product. You will increase your ROI when you focus only on influencers who are followed by your target customer. A baby-clothing brand, for instance, is better off using baby or mommy influencers, not a popular Instagram travel star or a pop singer. Goldfish, lili.lane and Little Blessing Co. are all brands selling baby products. 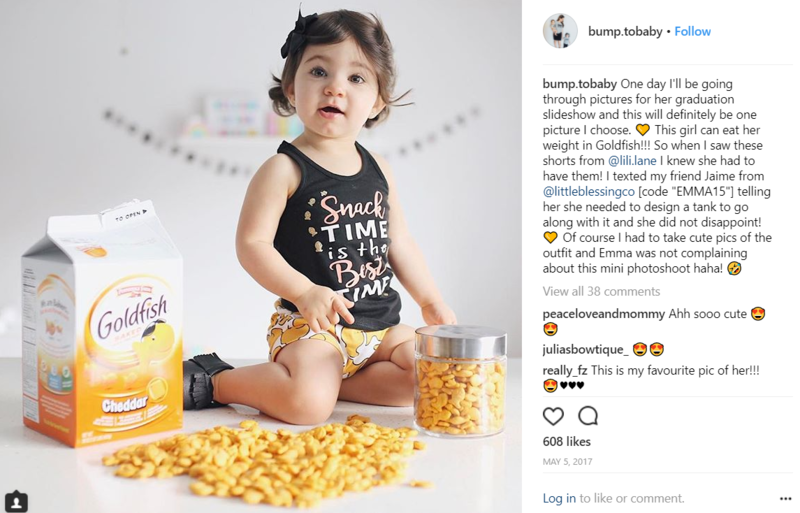 Goldfish sells baby food, the shorts on the baby are from lili.lane and the top is from Little Blessing Co. These brands are going to be seen by Laura’s followers who are mostly moms — the target customers of the brands mentioned. Now, how do you find specific influencers who your target customers mostly follow? Truth is you can simply do a google search like [industry term] + [influencers] and you’ll find a lot of options. But a better way is to hook up with influencers who already talk about your brand on social media. Or, consider working with influencers who talk about your industry — even if they’ve never said anything about you. Want to find relevant influencers for your business? Try Keyhole. So before doing a wild search on Google for relevant influencers to promote your brand, you could save time by employing the powerful search capabilities of a social monitoring tool. Use it to see which influencers are already praising your product. These people have more experience with your product, and if they’re so popular that they ignore influencer marketing deals, you’ll be able to get in touch with them fast. There are now more social networks out there than ever before — obviously. Therefore, it’s vital that you know which platforms your target customers use the most. You can, of course, be “everywhere” if you want, but you would be better off focusing your advertising efforts on relevant social platforms that will drive more brand mentions and ROI than others. So how do you find out where your target customers hang out the most? Again, you need a social monitoring tool to find this out. Take Ralph Lauren, for instance. Most of the fashion brand’s customers and retailers use the #RalphLauren hashtag to post the products they buy from them. The results show most of the hashtags come from Twitter, which means most of the brand’s customers would be found on Twitter. Instagram is next on the chart, then eBay and so on. This way, you can focus on driving more brand conversations from Instagram since that’s where most of your target customers are. Social media never sleeps, right? True. When Americans are sleeping, Asians and folks from other continents are wide awake tweeting and posting on social platforms. [There is] a growing realization among businesses that social media is the single most effective way to reach audiences, with teens with teens (i.e. tomorrow’s consumers) now spending up to nine hours a day on social platforms. However, while social media platforms are always active, there are days your audience is more active than most other days. 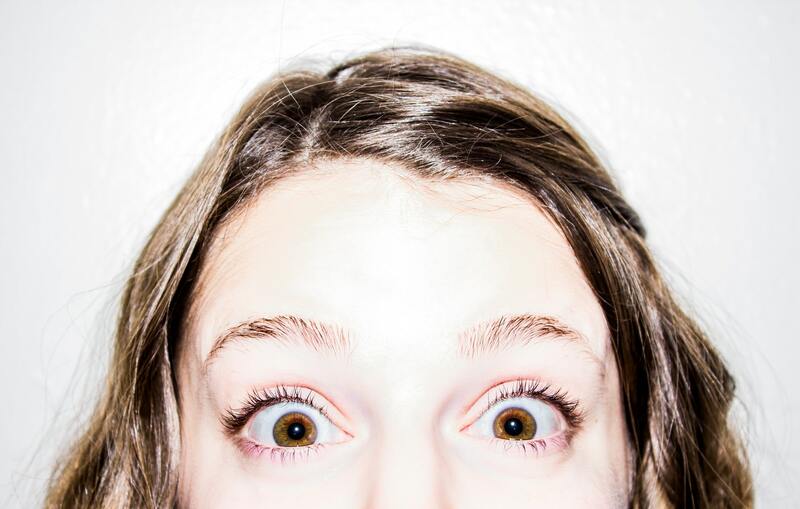 If your target customers appear to be hyperactive (in a good way) on certain days, it could mean those are the days they’re not bombarded with their jobs, family, or school (if they’re students). You want to take advantage of these days and engage them. Statistics show that posting on social media on specific days improves results. Hubspot, for instance, found that tweeting on Wednesdays gets more engagement than other days. However, not every research or study is exactly right for your business. You should check when your target customers are most active. You can do that with any good social monitoring tool. When they’re most active is the best time for you to post. 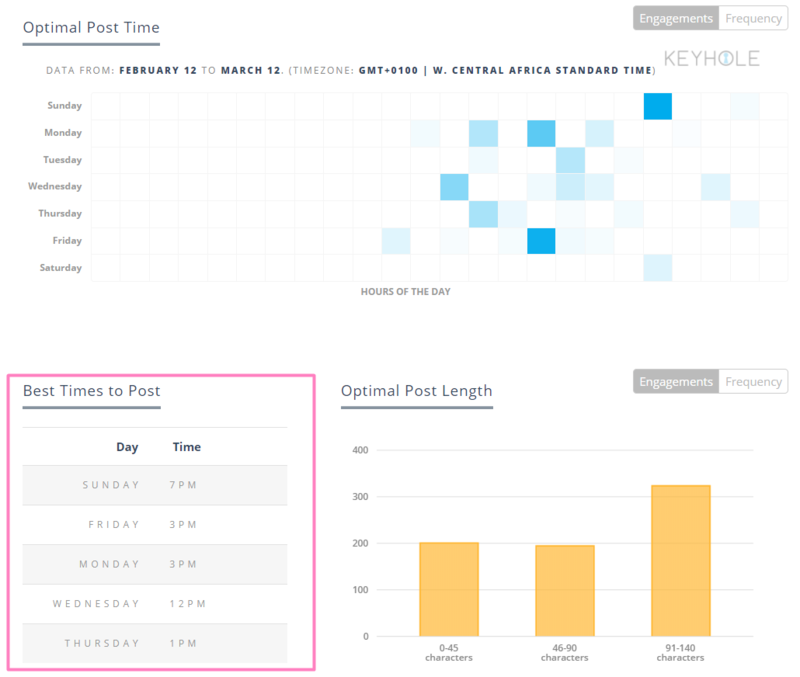 If you’re tracking your own social media account (or a competitor’s) using Keyhole’s Account Tracker, you will be given optimal posting times for that account based on engagement, taking out all the guesswork. 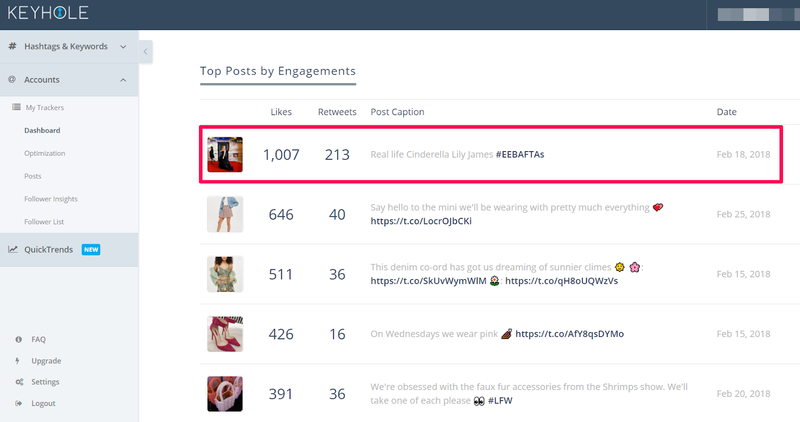 Want to see your competitor’s best engagement days on social? Try Keyhole. If ASOS was your competitor, you can see the days their customers are engaging with their tweets the most, and days they got little to no likes, retweets or replies. Of course, there’s nothing wrong with the Hubspot’s statistics I cited, but your business may be getting most of its engagement on other days of the week. You need to track and compare to the most effective with your outreach. If you’re not familiar with the term, UGC is: content (reviews) on social media generated by customers about your product. People trust other people recommending products to them more than advertising that comes directly from the brand. My encouragement to service providers would be to…think about “How do we create a modern, earned media strategy?” Because that’s what really works in social media – it’s more content creation on the earned media side. And rightly so. Whose recommendation are you more likely to trust — the brand’s or the consumer’s? Chances are high you’ll go for the latter. A customer saying something about you on social media can spark conversations that promote your business. And then, surprise of surprises, you find yourself receiving orders from the friends of a customer who just tweeted or posted about your product on Facebook, Instagram, Snapchat. Contests: Ask customers to share your product with a specific hashtag, and they get the chance to win a prize. Offer discounts: Encourage consumers to share your products with their friends and win discounts. Fun hashtags: Consumers, especially millennials, naturally want to share new products they buy or love with their friends. Give them a happy-sounding hashtag to do this. However, to make the most of UGC, you should consider sharing them on your timeline. That is, after customers post something about your brand, don’t just be happy you’re spoken well of, retweet or repost the UGC. This will improve your reach and will likely get you more brand mentions. Brand mentions can drive huge results for your business. Afterall, more mentions naturally mean more popularity. And more popularity leads to better brand awareness and ultimately sales. Use the strategies above and you can drive social interactions about your brand or product like never before. What do you do with what your customers and prospects say on social media? Hearing what customers say on social media is one thing, but understanding how to use their conversations to your brand’s advantage is another. 500 million tweets are sent every day. That’s ~6,000 tweets per second. A prospect could tweet something as simple as I need a black shoe right now and get the attention of seventy of her followers engaging with the post. What would happen, if you as a shoe brand (for instance) chime into that conversation with a link to your black shoe — including a discount coupon? When you learn from people who are already doing well, you’re in essence skipping the mistakes they made before getting to where they are today. You can avoid most of mistakes they made. Analyze your competitors’ marketing—see which efforts work well, and understand why stakeholders like them: What is their primary messaging? Why does or doesn’t it work? How do people respond to the company’s overtures online? Is word of mouth positive or negative? Why? Businesses perform better at social listening when they ethically learn from competitors who are already doing it right. Piecing together their strategy is like scoring a free cheatsheet. Visit their platforms to see how they’re doing their social media — responding to feedback, joining industry conversations, and so on . 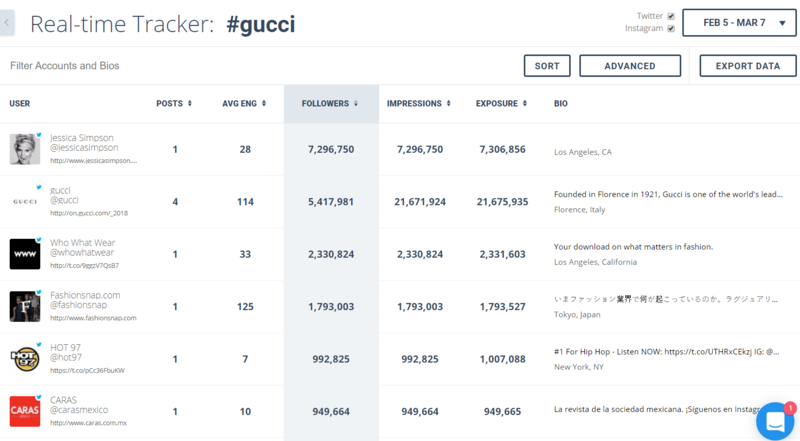 Fashion company Topshop, for example, is a good brand to learn social listening from. And of course, there are several other brands out there that are awesome at this. While many other fashion brands only only take advantage of world-renowned events like Valentine’s Day and Christmas, Topshop takes advantage of other smaller festivals or events — especially in entertainment and fashion space. 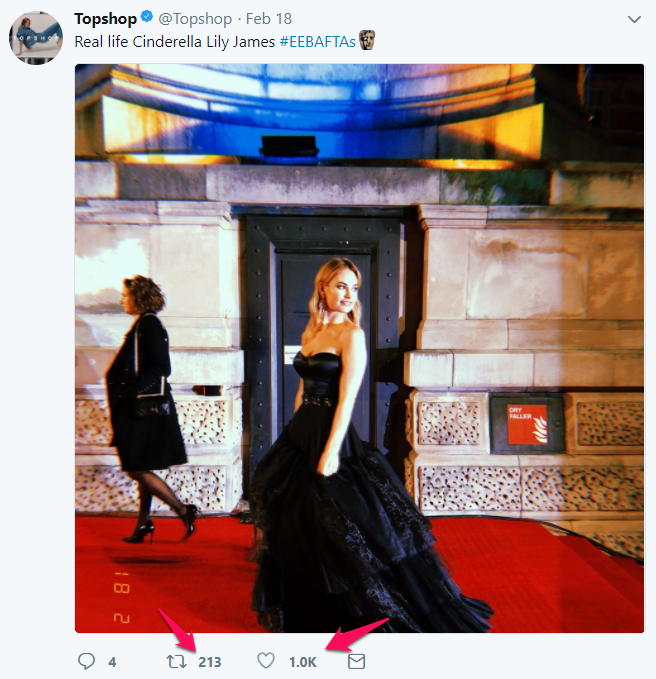 When conversations about #EEBAFTAs (the hashtag for British Academy Film Awards) were trending on Twitter, Topshop joined in. Remember, this is an event many other fashion brands don’t value as much as they do more popular events. 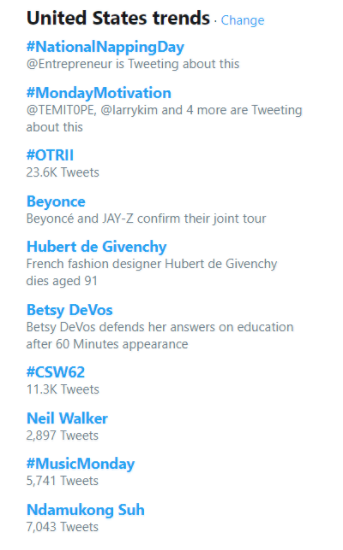 Well, Topshop decided to participate in the conversation on Twitter and their engagement rate soared higher; one of their tweets (the tweet image above) with the hashtag became the most popular on their timeline. Want to see your competitor’s best performing posts like this on social? Try Keyhole. So, when looking for brands to learn your social listening strategy from, companies like Topshop are good examples to learn from. They look at other industry-related events that most of their competitors aren’t looking at and take advantage of them. There are hundreds or even thousands of other brands you can learn from. Do your research on brands doing social listening well in your industry and see how you can learn from them. But what if you step into a lively conversation and get a slap in the face? You need to know when to enter an ongoing conversation on social media. Social media is built on conversations, and consumers want to be talked to, not sold to. Talk to your audience, make conversation, build relationships. Consumers are people and they don’t want to be sold to, they want to be engaged so engage them. But it’s not just getting into conversations with prospects that’s important, you also need to know when and when not to engage them. Ever gotten into a conversation and then realized you shouldn’t have? Or maybe your timing was just off? When to enter an ongoing conversation is crucial. It determines whether or not you’ll be getting any benefits from your social listening efforts or not. It determines whether you’ll get bashed or praised for joining a conversation. Avoid regret. Pick and choose your times to engage. Customer service related queries require your immediate response. Customers get angry all the time for different reasons, and you want to ensure they don’t stay angry. Or they need to ask questions before buying from you. In any case, you want to respond to customer service requests fast. Trying to take advantage of a social media conversation about a government policy that hurts people is an example of a potentially bad time to enter a social media conversation (depending on your stance). For instance, following a ban from the US president last year, people from Muslim-majority countries were banned from entering the US. Taxi companies weren’t happy about this, and so they all went down the JFK airport and stopped pickups from working. If you’re not going to sympathize with people who find a particular policy disturbing, it’s best to stay away from conversations like this. Sometimes it’s best to remain silent — when saying anything at all will make a situation bad on all sides. Depending on the vitriol being spread, you may just want to pretend you didn’t hear a thing. A smart rule of thumb is to only get involved in conversations when you know you won’t get burned or miss out on significant benefits. An angry customer is egging people on and you feel you might be baited into a fight – Do not chime it. You feel tempted to speak ill of a competitor’s product. – Do not chime in. You feel tempted to market your Spring bouquets on Christmas Day (making you look like an extraterrestial)- Do not chime in. You will literally miss the party if you don’t get into a conversation on time — like tweeting about Valentine’s Day on February 15 – Chime in! You won’t get burned for marketing your Valentine’s products on Valentine’s Day – Chime in! These are just a few examples. Think up a few you want to avoid or join. But it’s still not always this straightforward, right? Sometimes it can get really dicey and you won’t be sure whether or how to respond to feedback in the sometimes volatile social arena. Everybody’s watching, remember? And bad news travels fast. It was quite an insult thrown at the cereal brand, but they kept quiet. While Cap ‘n Crunch were probably still nursing their bruise, their competitor (KFC) saw a potential win for their own marketing. So they replied the tweeter, calling Cap ‘n Crunch a has been. What would you do in this situation? It rarely ever happens that competitors throw public insults at each other — so you have almost no case studies to learn from. 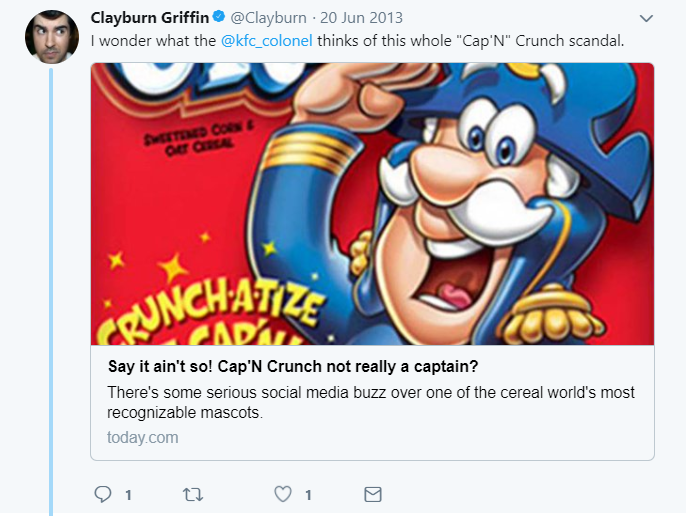 Cap ‘n Crunch probably wasn’t sure what the outcome of their clapback would be. But they took the risk anyway. As it turned out, it worked for them. 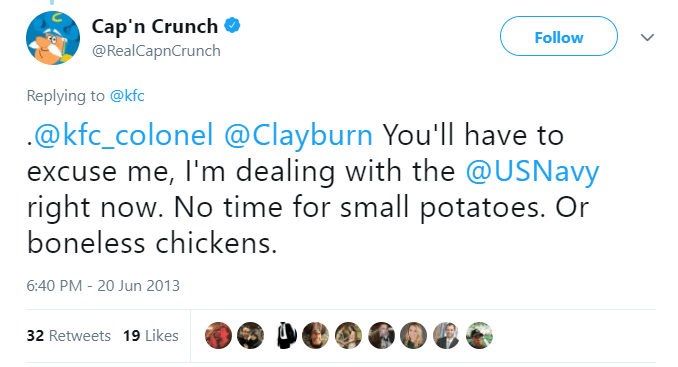 Cap ‘n Crunch’s tweet clearly got more love than KFC’s. Should you do the same if you were in this situation? Sometimes it isn’t rocket science to know when to enter a conversation. Sometimes it is. A smart rule of thumb, however, would be to only respond to conversations that clearly CAN BE handled. And apologize when occasion demands. Another good social listening practice is to have your social media team collaborate with relevant departments in your organization to provide accurate information. Social media is clearly not a secondary channel for marketing anymore, it’s the main channel today. And if that’s the case, then it’s worth having all relevant departments in your organization collaborating on it. 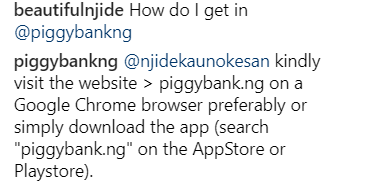 When an issue is brought up by a customer that your social media team doesn’t have enough expertise to handle, have them link up with the relevant departments that can provide apt feedback or information. 78% of customers say competent service reps play a huge role in a happy customer experience. Service reps can’t be competent if they aren’t fed the right information by relevant departments. So departments in your organization need to collaborate with your social listening efforts. Customers hate it when they reach out to your customer service via social media and don’t get a satisfactory response. Or when you tell them to send an email to get an issued solved. Nothing beats you giving them the right response right from social media where they contacted you. I have for 10 years—long before Facebook was even on the map—called myself a “relationship marketing specialist.” And I love that term because to me it transcends the medium. It’s all about people doing business with people. — Mari Smith, Top Facebook Marketing Expert. And remember, it’s social media — everybody’s watching. This doesn’t mean your programmers, finance people, and other staff need to abandon their roles all the time to respond to customer complaints on social. But they can play a huge role in assisting your social media managers with the relevant information they need. An open communication line between the social media team and relevant departments can work wonders here. That said, your entire social listening effort, however, is nothing without a good social monitoring tool. Social media listening tools help you analyze what’s been said about your brand and industry on social media. There are many social media monitoring tools out there, which makes choosing the right one a challenge sometimes. But you need to find the right one for your business anyway. An inefficient social listening tool will make your social marketing efforts unnecessarily hard and frustrating. If, for example, your tool can’t help you sort out the different sentiments in your social mentions, it’s going to be really hard to start scrolling through the many mentions you get to get the one(s) you’re looking for. 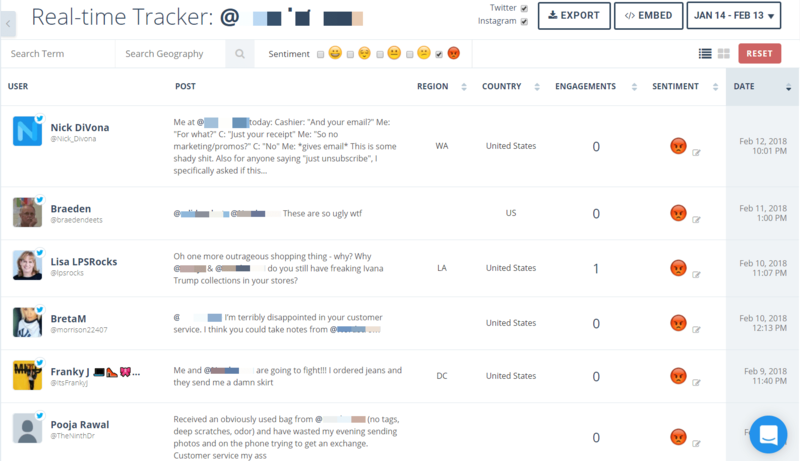 Want to monitor your social media mentions like this? Try Keyhole. Social conversation monitors have different capabilities. Some provide basic functions while others offer more advanced features. You want to pick the one that offers the functions that matter to your business. 5. In the end, how much is social listening doing for you? You need to track metrics that matter. Otherwise, it’d be all for nothing. And there are lots of things to track, but you need to spot the ones that really matter to your business. Sentiment: How many mentions about your brand are favourable or otherwise. Popularity: How many mentions are you getting per day, week or month? Influencers: Who are the influencers talking about you, how many are they and what are they saying? Most engaging topics: Which topics get the most likes, replies and reposts? Knowing this will help you understand where to focus your social listening efforts. What you do with what you’re hearing about your brand is critical in this age where it feels like social media is controlling the world. Use the strategies in this piece to make the most of what’s being said about you and your industry. Now let me tell you about Dr. Blevins’s research. We all remember the Women’s March of 2017. It was one of the largest demonstrations in US history, with millions of people marching in the US alone, and hundreds of other marches happening around the world. It quickly became a source of interest for many. How did a movement with no defined goal or governing body make such an impact, mobilizing millions? This is what Dr. Blevins sets out to answer in her paper “The Women’s Convention: Reclaiming a Movement”. 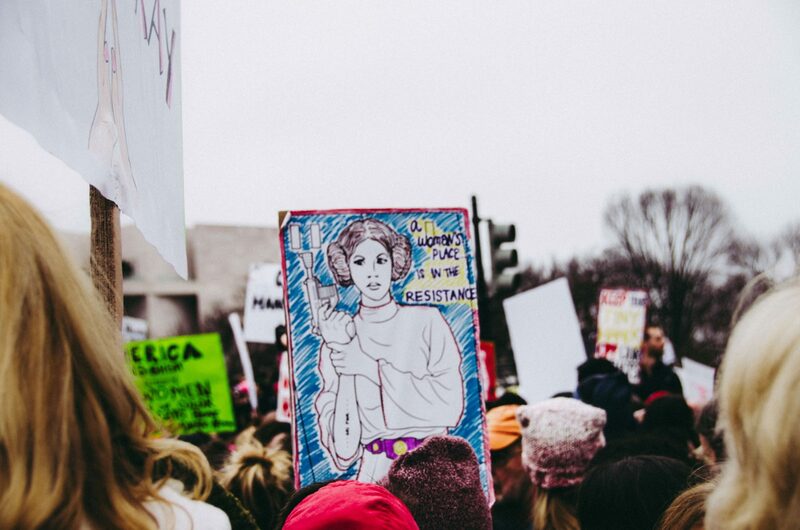 In it, she explores how the Women’s March movement was able to gather much-needed resources through social media, ultimately allowing it to scale to the Women’s Convention of 2017. 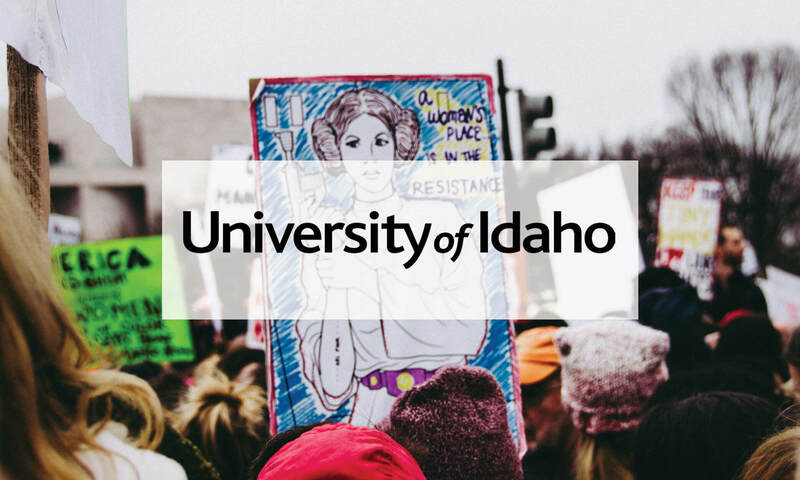 Using Keyhole, Dr. Blevins analyzed the posts being made by the Women’s March Facebook page, noting what posts were being shared with the intention of gathering resources for the convention. 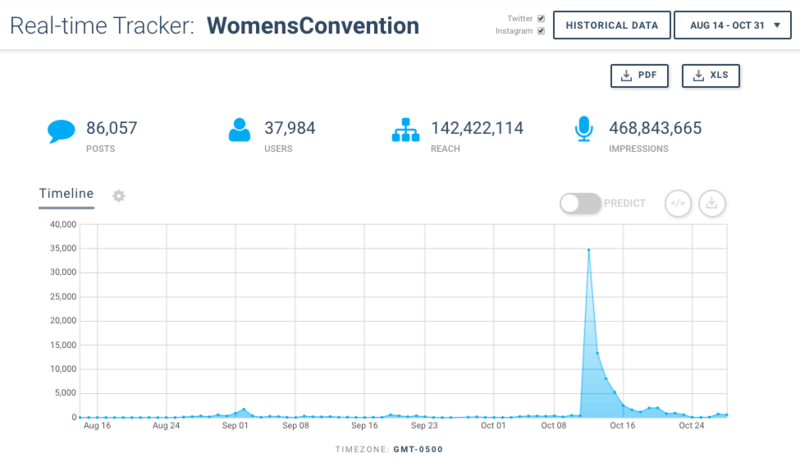 She also tracked the overall impact of #WomensConvention on Twitter and Instagram, analyzing overall reach and impressions. 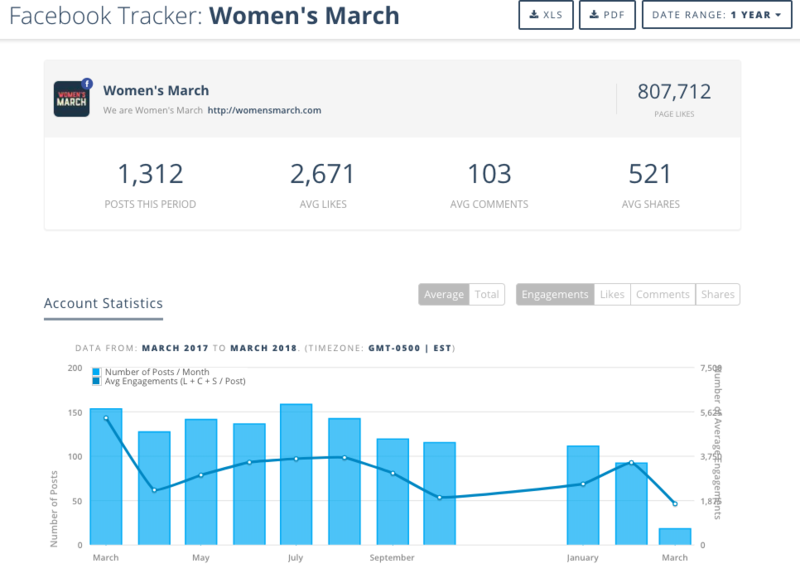 “During the same two month spread that this paper focused on for official posts from the Women’s March Facebook page, there were 85,867 posts tagged with the #WomensConvention hashtag. Those user posts had a reach of 142 million unique users, and made over 456 million impressions. She shares with us that many researchers are not yet using tools like Keyhole to gather data in this way, but this is a change we will likely start to see in the future. For Dr. Blevins, however, using Keyhole has proven to exponentially increase the amount of data gathered. She also shared with us that our historical offering was particularly useful, especially “at a price point that an academic can afford” (historical offering= gathering old posts that were shared on social). Overall, working with Dr. Blevins has helped us understand how Keyhole can be successfully applied as a research tool, an exciting use that we can’t wait to see more of. “While this software is usually used by advertisers as part of their in-depth social-media analytics, it holds valuable insights for social media research as well” (Blevins, “The Women’s Convention: Reclaiming a Movement”). 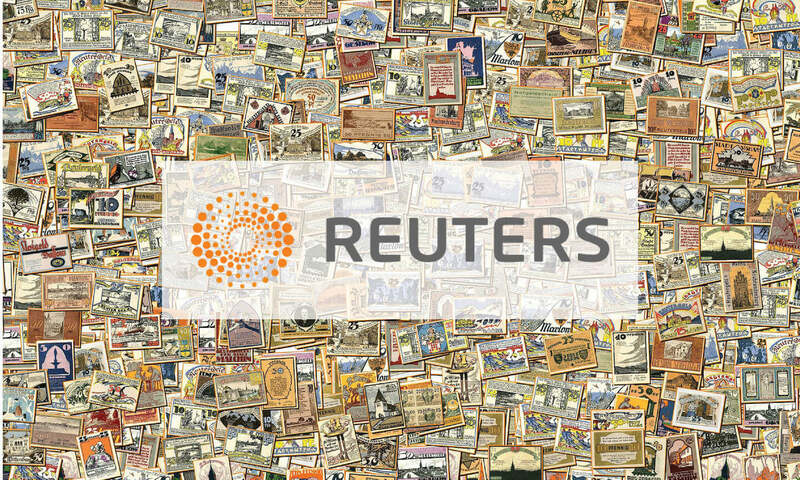 Melissa Fares is a social media reporter for Reuters. Based in the New York office, she covers stories that affect — and are affected by — social media trends. She uses Keyhole analytics to track breaking news, develop story ideas and supplement articles with comprehensive data. Melissa wants to find out which hashtags and keywords were trending in relation to breaking news stories, and this task introduces a set of challenges. As journalists compete to break news while social trends rapidly grow and pass, Fares needs a tool to monitor online conversations in real-time. Platforms that don’t offer live tracking can’t keep up with a newsroom’s fast pace, she says. Covering state-, national- and international-level news creates a need to know where social media trends develop and gain steam. Unravelling the context of social media trends is what helps Fares add detail to her articles and think up other story ideas. Therefore, she not only needs to monitor online conversations but also track related hashtags and keywords while identifying influential users. “Keyhole has taken me in a lot of directions that other platforms haven’t,” says Fares. 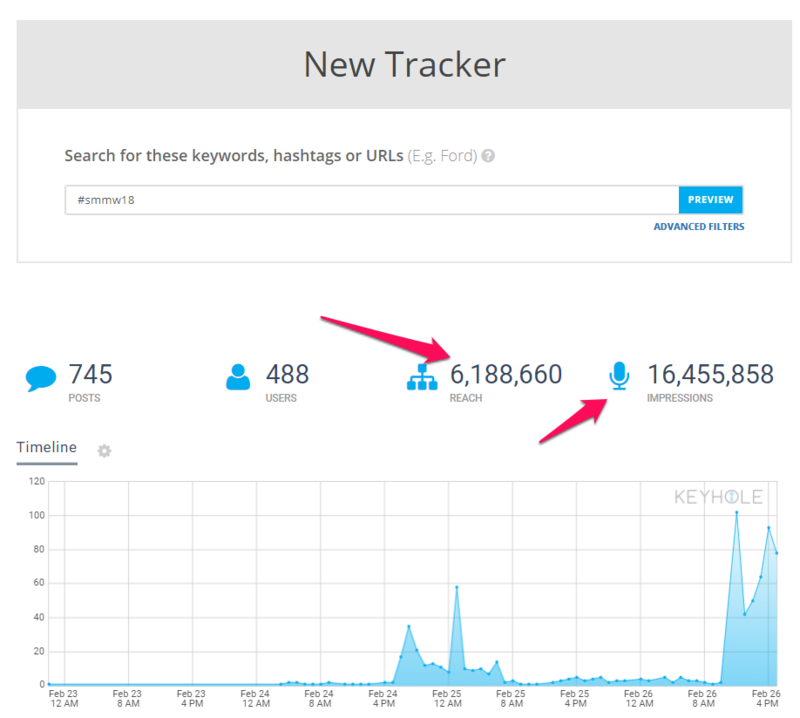 The tool identifies the most popular hashtags and keywords used with your tracked terms. 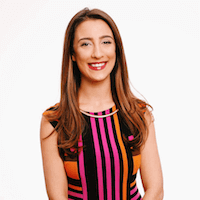 This feature helps Fares find new trends and track data associated with them, helping her either craft stories or add more detail to articles. Fares has used Keyhole data to write stories ranging from the health effects of bacon to the United States presidential election — one of the most popular being about Donald Trump’s proposed Muslim ban. By tracking hashtags and keywords relating to the Republican candidate, she identified which five states were talking most about the ban. “(Keyhole) is everything a journalist wants to use in a breaking-news situation since it’s quick and easy to use,” says Fares. Inputting a keyword will quickly generate data by analyzing a sample of relevant posts, updating in real-time. Unlike other tracking tools, there is no need to authenticate your Twitter or Instagram account. You also don’t have to fill out a complex form to start your search. 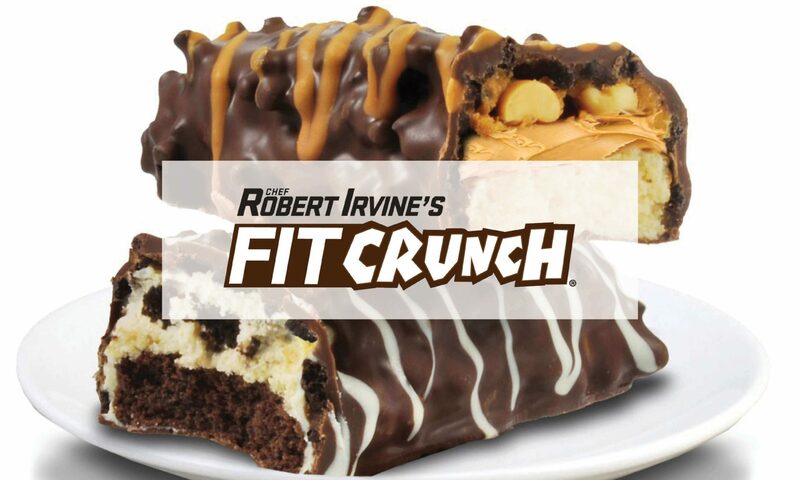 FITCRUNCH® IS THE FITNESS COMPANY known for FITCRUNCH® Baked Bars–inspired by world-renowed chef Robert Irvine and FortiFX founder Sean Perich. Like many other businesses, FITCRUNCH® started with traditional marketing. A $14,000 budget on print ads for example, would amount to about 100,000 e-mail subscribers. Soon, the company’s marketing strategy expanded to include social media marketing and influencer marketing. The company started working with Keyhole to engage with influencers (you can do this through the influencer tab in your dashboard), in order to expand and engage their customer base, eventually also using the tool to measure their impact. Since launching their influencer program with Keyhole, FITCRUNCH® has found and engaged with around 20 new influencers a month. This allows the company to get the word out about new flavours they are testing and the latest news and promotions. FITCRUNCH® creates a unique hashtag for each influencer partner, and uses Keyhole to measure social success against actual sales. They easily monitor who’s talking about them, who’s driving fan engagement, and each influencer partner’s success, so it can plan strategic partnerships. Keyhole’s visual reports allows FITCRUNCH® to easily assess their marketing efforts with hard meaningful data. 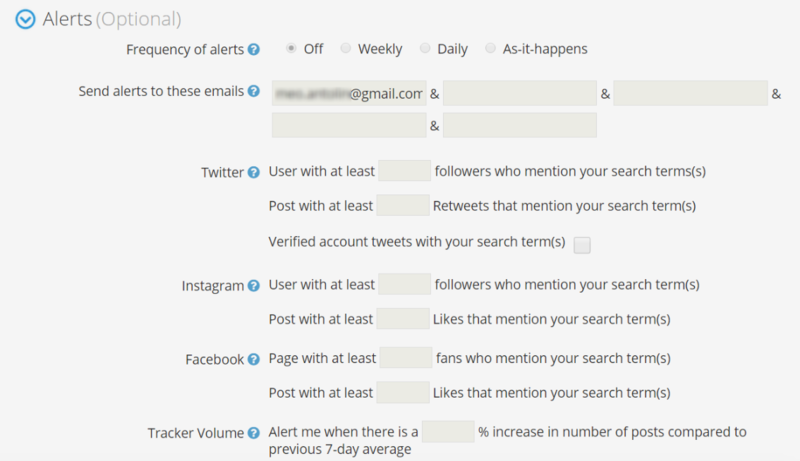 Alerts also notify FITCRUNCH® when specific users, or users with more than [x] number of followers posts using their hashtag, keyword or handle. 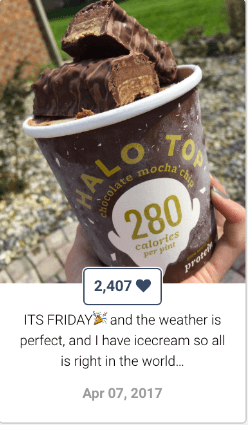 This allows the marketing team to repost this top user-generated content to their accounts to drive buzz to their social campaigns. 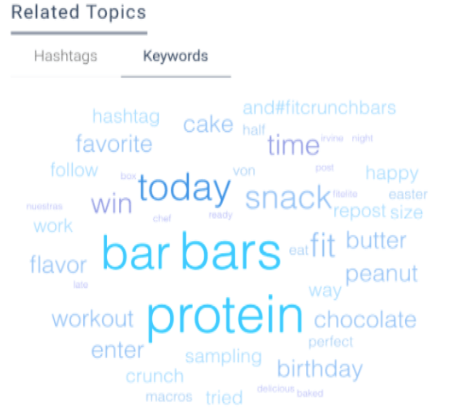 Robert Irvine with Dale Earnhardt Jr.
Case in point: When FITCRUNCH® launched a new protein bar flavor called birthday cake, they were able to use the word cloud and see certain retailers popping up. This helps FITCRUNCH® to make strategic decisions such as which retailers to partner with. 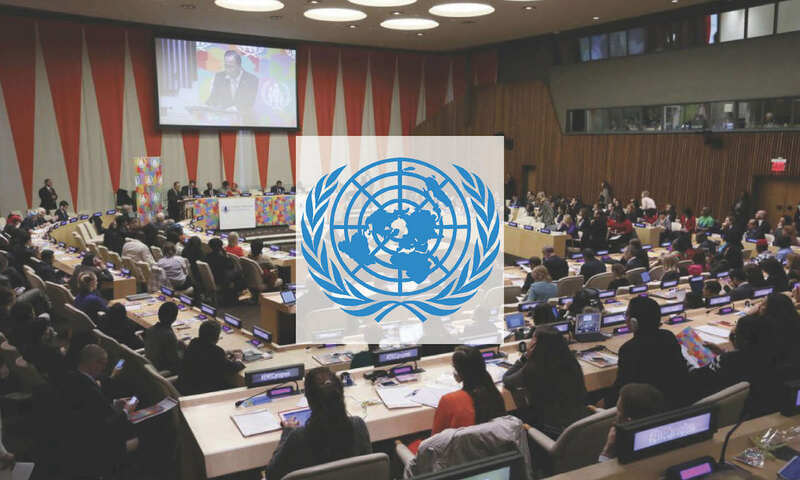 Every Woman Every Child is an unprecedented global movement that mobilizes and intensifies international and national action by governments, multilaterals, the private sector and civil society to address the major health challenges facing women and children. Every Woman Every Child was launched by UN Secretary-General Ban Ki-moon during the United Nations Millennium Development Goals Summit in September 2010. 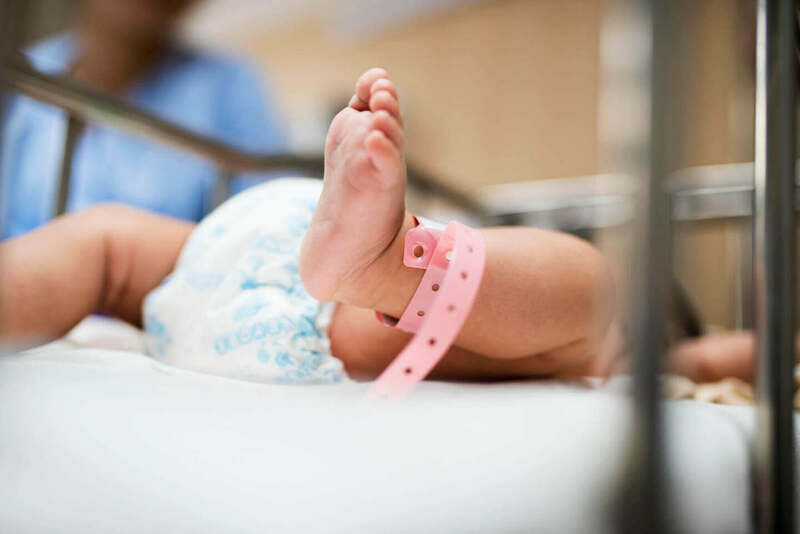 The movement puts into action the Global Strategy for Women’s, Children’s and Adolescents’ Health, which presents a roadmap to ending all preventable deaths of women, children and adolescents within a generation and ensuring their well-being. Every Woman Every Child (EWEC) is a UN initiative aimed at reducing maternal and child mortality, and improving health overall. Much of their work focuses on advocacy, and helping people to understand why the health of women and children is critical to societies. As part of this, they needed to understand who they were reaching on social media, and how they could measure the success of their strategies. The social media team at Every Woman Every Child was kind enough to share with us their goals on social and what they hope to accomplish with their various initiatives. A key component of effective messaging was getting a grasp on their truly global audience- Where are these people from? What devices do they use to access and engage with our content?— while also capturing and mobilizing this data so that they make effectively drive their campaign forward. What is our demographic split in terms of geography, gender, sentiment? Are we reaching enough men and boys as well as women and girls, and if not then how can we improve? What devices are people using to access content? How effective are our partnership engagements?